Equipo Nizkor - UNODC - Monitoreo de Cultivos de Coca 2014 - Perú. In 2014, coca cultivation in Peru fell to 42,900 hectares, which represents a decrease of 13.9 per cent compared with the 49,800 hectares recorded in 2013. The cultivated area has been reduced by about 30% since 2012 (60,400ha)- an unprecedented and welcome result in efforts to curb illicit cultivation and trafficking in Peru. Alongside the Government's decision to increase annual eradication goals and the scope of related actions, while pursuing complementary pre- and post-eradication strategies, we have seen an enhanced focus on promoting alternative livelihoods in coca growing areas and expanding drug abuse prevention and treatment services, as well as on enhancing precursor control and stepping up seizures of assets linked to drug trafficking activities. It is important that these initiatives are undertaken in a consistent and complementary manner throughout areas affected by illegal coca cultivation, as there remain communities vulnerable to growing coca for drug trafficking. The results attained by Peru's Counter Narcotics Strategy (2012-2016) deserve the support of the international community and private sector, to assist affected communities, relieve dependence on coca cultivation and create the necessary conditions for people to thrive outside of illegal markets. As we have seen, alternative development has the potential to break the vicious cycle trapping poor farmers. The World Drug Report 2015 devotes a thematic chapter to alternative development, based on experiences in countries including Peru. Our analysis shows that alternative development can work, when initiatives are informed by a long-term vision, sustained with adequate funding and political support, and integrated into a broader development and governance agenda. Moving forward, the post-2015 development agenda and the process towards the 2015 UN General Assembly Special Session on the world drug problem can provide an important impetus for further enhancing these efforts. Finally, we would like to thank the Peruvian Government for its support to UNODC, which made the implementation of the 2014 Coca Monitoring Survey possible. En el año 2014, el área cultivada con coca en Perú se redujo a 42,900 hectáreas, esto representa un decremento de 13.9 por ciento, en comparación a las 49,800 hectáreas reportadas en el 2013. La extensión total de cultivos de coca se ha reducido alrededor del 30% desde el 2012 (60,400 ha) un resultado sin precedentes y bien recibido en el esfuerzo por mitigar el cultivo de coca y el tráfico ilícito de drogas en el Perú. Junto a estos esfuerzos, el Gobierno también ha buscado implementar nuevas iniciativas promoviendo medios de vida alternativos en zonas de cultivos de coca y expandiendo servicios de prevención y tratamiento sobre abuso de drogas, y también en la mejora del control de precursores y el incremento de las incautaciones de los activos o bienes vinculados a las actividades de tráfico ilícito de drogas. Es importante que estas iniciativas se lleven a cabo de manera consistente y complementaria en todas las áreas afectadas por el cultivo de coca, ya que sigue habiendo comunidades vulnerables a la actividad cocalera ligada al narcotráfico. Los resultados alcanzados por el Perú, en el marco de su Estrategia Nacional de Lucha Contra las Drogas (2012-2016), merecen total apoyo de la comunidad internacional y el sector privado, para asistir a las comunidades afectadas, aliviar la dependencia sobre cultivos de coca y crear las condiciones necesarias en favor de que las personas se desarrollen fuera de mercados ilícitos. Como hemos observado, el desarrollo alternativo tiene el potencial de romper el círculo vicioso que atrapa a los agricultores más pobres. El informe mundial sobre drogas 2015, dedica un capítulo central sobre este tema, basado en las experiencias de países como Perú. Nuestro análisis muestra que el desarrollo alternativo puede funcionar cuando las iniciativas son sustentadas por una visión a largo plazo, apoyada por el financiamiento adecuado y el debido soporte político, y son integradas en una agenda de desarrollo y gobernabilidad más integral. En el futuro, la agenda de desarrollo post-2015 y el proceso hacia la Sesión Especial de la Asamblea General de la ONU en el 2015 sobre el problema mundial de las drogas, pueden proporcionar un impulso importante para intensificar aún más estos esfuerzos. Finalmente, quisiéramos agradecer al Gobierno del Perú por su apoyo a UNODC, ayuda que ha hecho posible la implementación del Monitoreo de cultivos de coca para el año 2014. The 2014 Coca crop Survey highlights some important advances with regards to the variation of the coca leaf plantations distribution and presence. The results show that the total area of coca leaf plantations nationwide, for the third consecutive year, is decreasing. 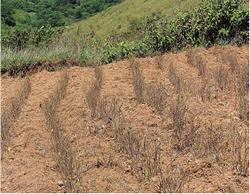 As of December 31st, the cultivated area was 42,900ha, that is, 13.9% less compared to 2013, when it was 49,800ha. The largest cultivation areas can be found in the VRAEM |5|, 18,845ha; and La Convención y Lares with 10,342ha, which together account for 68.0% of the total coca growing area in the country. 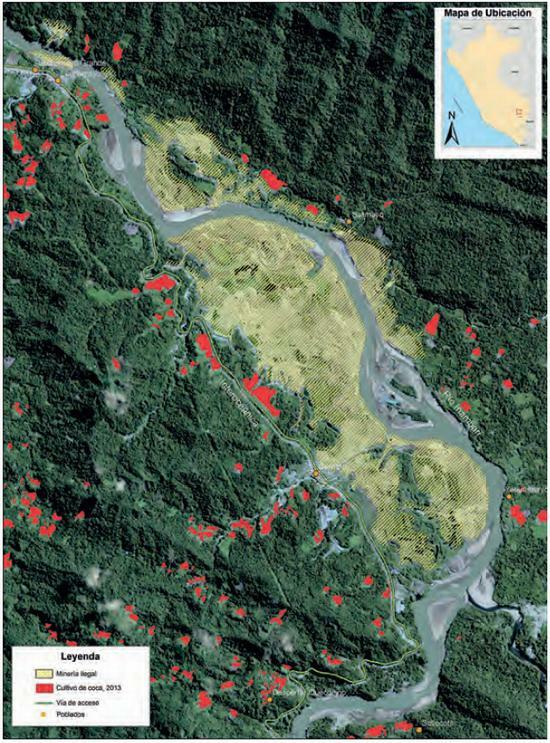 In order to calculate these areas, high spatial resolution products have been used (SPOT 6/7 with 1.5 m spatial resolution) registered between August and November 2014. The processing of these products and the systematic air verification (geo video and high definition videos taken by the Peruvian Air Force) have allowed polygonal delimitation and measurement of the areas occupied by coca leaf plantations, with a significant increase in accuracy and detail, therefore, the results obtained for 2014 are more accurate. 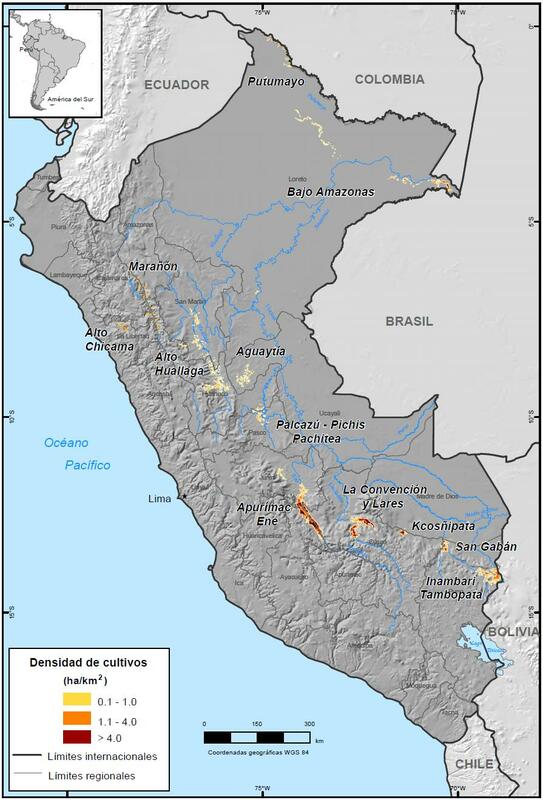 The reduction in cultivation area in 2014 is largely due to the planned eradication actions carried out by the Peruvian Government (DEVIDA) and executed through CORAH. According to the data reported by this institution, these actions have been executed under two perspectives. 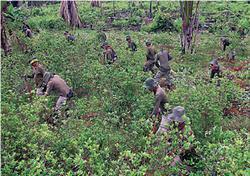 Until 2011, when the largest coca areas were registered since the year 2000 (62,500ha), eradication had been mainly oriented to contain the expansion of coca cultivation, promoted and demanded by drug trafficking, to supply a greater and growing demand of the cocaine consumer markets (mainly Europe and North America) and moreover, to cover the requirements of the new markets in Latin America, Asia and Africa. 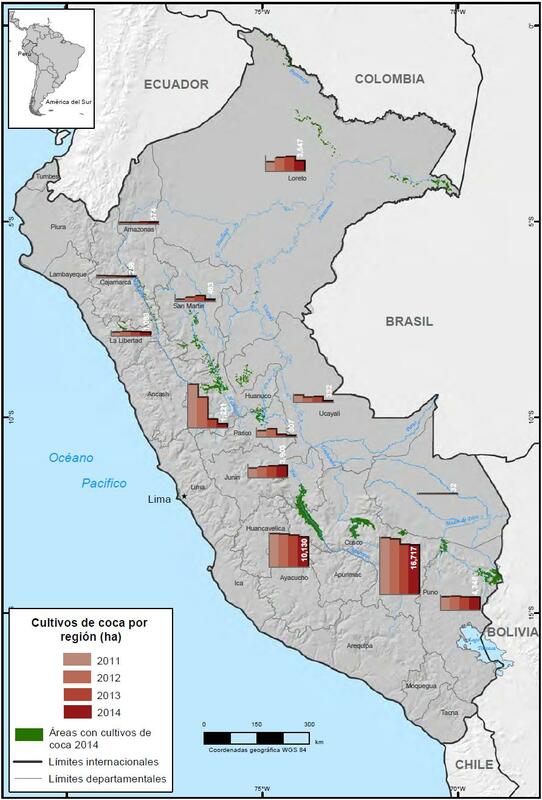 Once the Peruvian Government managed to contain the expansion of these areas by 2012, the strategy was then oriented to effectively reduce the areas destined for coca leaf plantations, therefore the Government decided to substantially increase its annual eradication goals until they reached 31,205ha in 2014. 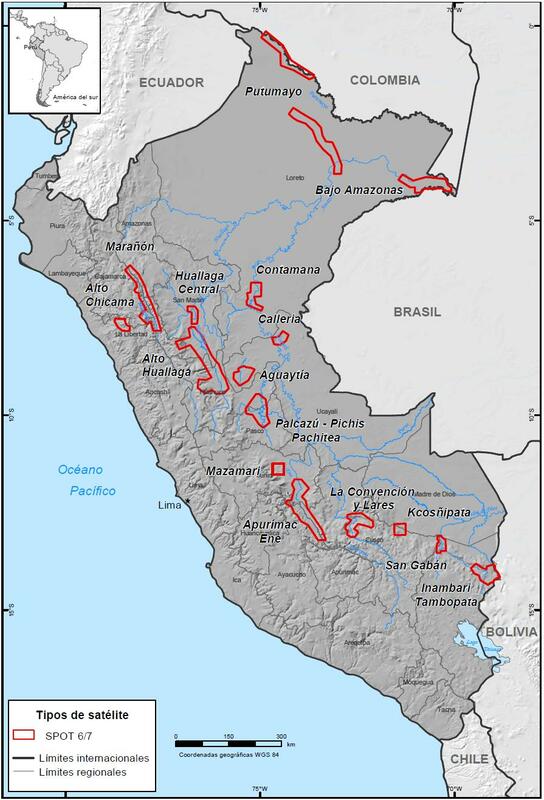 Simultaneously, the Government started to intervene in flagship areas where coca leaf and coca by-product production showed an evident link to drug trafficking such as the Pichis-Palcazú-Pachitea, Aguaytía, Alto Huallaga northern sector, Orellana and Caballocha-Cushillol-lococha (Lower Amazon - Amazon Trapezium) areas and those high risk areas where this illegal activity had been going on for many years under the protection of subversive groups such as in the Monzón and Southern Upper Huallaga), areas which for many years had been a sort of "free trade area" for IDT |6|. It is important to note that the pre eradication |7| strategies and social support actions by the Peruvian Government (DEVIDA) contributed to a successful interven-tion even in the high risk areas as the ones mentioned above. Thus, social conflicts and protests have not been as large as expected. 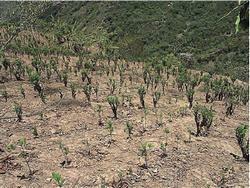 During these three years (20122014) an accrued reduction almost 30% compared to 2012(60,400ha). Another factor that has contributed to the reduction of the coca leaf production for the second year is the temporary abandonment of La Convención y Lares areas. In 2013, 13.7% of the total growing area in 2012 was abandoned (12,558ha). In 2014, abandonment has represented 4.6% of the total area in 2013 (10,843ha). 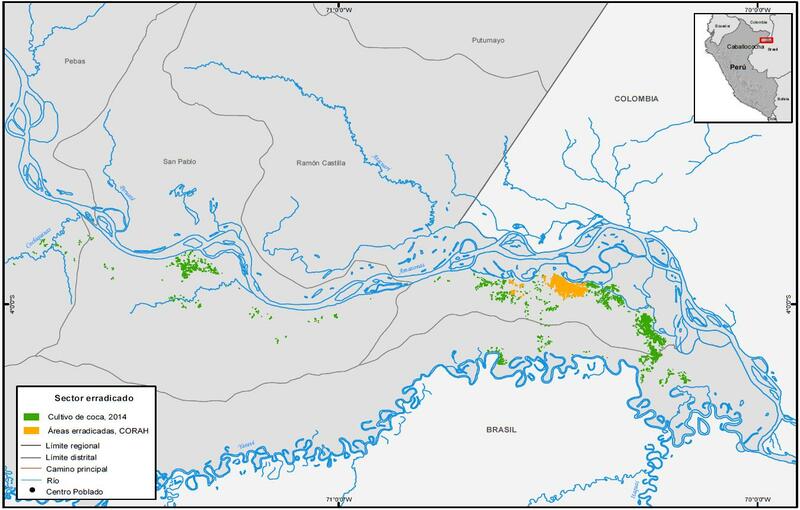 As in the former year, the greater abandonment took place in the Yanatile river basin, although it is also visible in other areas of this coca growing region. 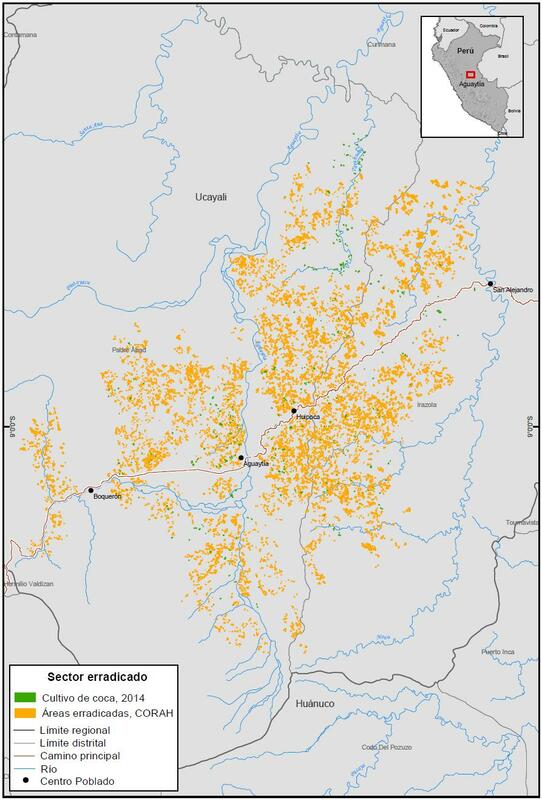 This is attributed to the greater demand and greater salaries paid by the works performed by the local and regional governments, as well as by private companies engaged in gas exploitation at Camisea |8|. The salaries exceed by far the amount farmers receive through legal farming or coca growing practices, causing a significant number of farmers to opt for these jobs, leaving these two activities unattended. 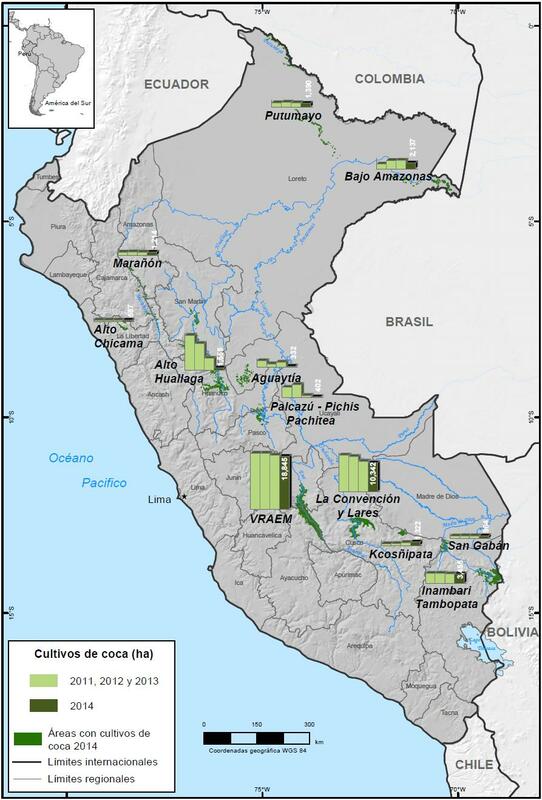 The areas that showed an expansion of coca growing plots in 2014 were Kcosñipata (19.1%), Marañón (6.5%) and San Gabán (5.9%), compared to the 2013 figures. 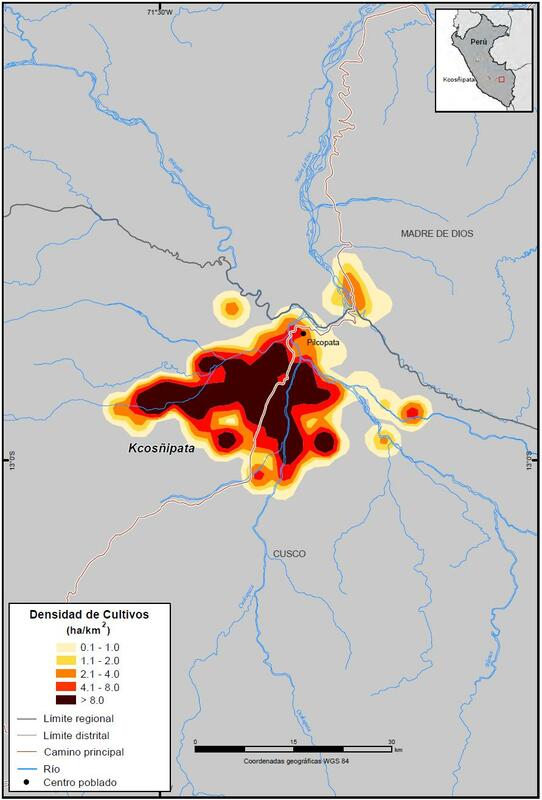 In the cases of Kcosñipata, San Gabán, it is the response to a greater demand for cocaine base paste, which is sent to the border of The Plurinational State of Bolivia, a stopover before entering Brazil. In the case of Marañón, the reason is the same, but the main destination is the city of Chiclayo, from where it is later sent to the port of Paita in Piura to Ecuador. 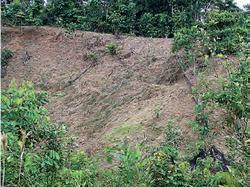 The reduction of the coca growing areas has basically occurred in those areas where CORAH has intervened. 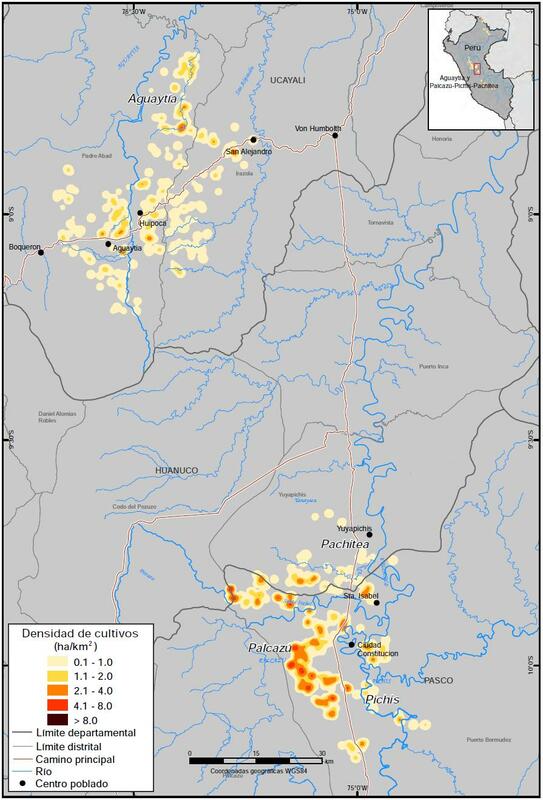 The magnitude of this reduction had a greater impact in Aguaytía, High Huallaga (including Monzón), Pichis-Palcazú-Pachitea, Orellana, and Caballococha. In 2013, these areas together represented 10,410ha. 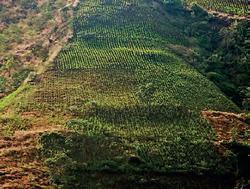 By 2014 this area decreased to 4,446ha, which means a reduction of 57.3%. The remaining production areas in Peru such as VRAEM, La Convención y Lares, Inambari Tambopata among other, showed a relative stability compared to 2013. National dry coca leaf production in 2014 was 100,840TM. 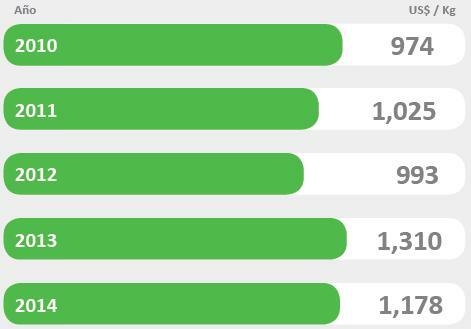 According to INEI, out of this total, 9,000 TM correspond to traditional consumption. The remaining volume, 91,840TM, is used by drug traffickers to be transformed into base paste or cocaine hydrochloride. The largest growing area for some years now is VRAEM. 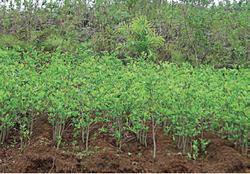 Here, coca bushes are handled with high technology. Compared to the other producing areas, it registers an average yield of more than 3.5 TM/ha of leaf obtained in 4 or 5 harvests per year. 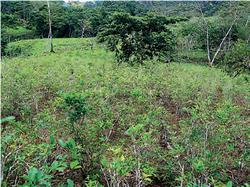 Therefore, the total amount of coca leaf produced in VRAEM accounts for 67.8% of the total domestic production. 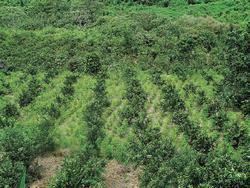 The lower coca leaf growing indexes are in High Chicama with an average yield of 0.8TM/ha. 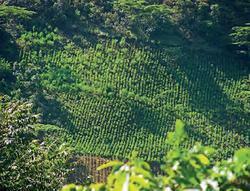 The domestic average yield estimated for 2014 is 2.35TM dry coca leaf per hectare. Regarding the price of dry coca leaf, in 2014 as in 2013, the average price paid was US$ 4.3/Kg, a relatively high price, compared to the average US$ 3.3 /kg paid between 2008 and 2012. As it was pointed out, this increase responds to the internal "balloon effect" resulting from a significant reduction of the coca growing areas and thus, a lower supply of coca leaf. The highest price, as usual, was registered in the Monzon area, at US$ 5.2 /Kg and the lowest one in VRAEM, US$ 3.7 US/Kg correspondingly. In this regard, until 2012 the lowest coca leaf price was found in VRAEM, between US$ 2.7 and 2.8 /Kg. 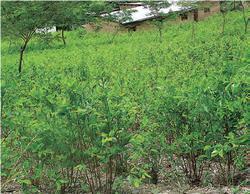 Starting in 2013, the price rose above US$ 3.0 US/Kg of coca leaf, as a result of a growing demand. With respect to the average prices of coca by-products, in 2014 the price of coca base paste was US$ 843.0 US /Kg. Compared to the 2013 price, US$ 863.0 US/Kg, it showed a slight reduction in 2.3%, so it has been relatively stable. In 2014 the average price of cocaine hydrochloride was US$1,178 US/Kg, 10.1% lower compared to the 2013 price (US$ 1,310.0/kg). This lower price is related to purity levels. It is also important to note that over the past five years, the routes used by drug traffickers for the exit of coca base paste and cocaine have changed, as the Peruvian Government has implemented control measures in different places. Until 2010, the drugs left the country by land mostly, to the exit ports in the coast and through the border areas with the Plurinational State of Bolivia. In 2011 the drugs started to be transported by air, from the Pichis-Palcazú-Pachitea area. That year, UNODC detected the existence of 49 landing strips, which increased to 77 by 2012. As in the case of land routes, the flights left to The Plurinational State of Bolivia and then continued to Brazil. At the beginning of 2013, the Peruvian Government managed to dismantle 80% of these illegal landing strips. As a result, new strips were cleared in the VRAEM. As of October 2014, UNODC had detected 80 illegal landing strips. Flights leave these landing fields to Brazil, through The Plurinational State of Bolivia. Finally, during the past two years, there has been an increase of drug smuggling through the ports of Callao and Paita, among others, as reported by DIRANDRO and the different media. These reports also state that "drug traffickers" have achieved high penetration levels in both ports, thus allowing them to introduce significant volumes of drug in containers, ready to be shipped to different interesting destination ports which they know in advance. El reporte de monitoreo de cultivos de coca destaca importantes avances referidos a la variación de la distribución y la presencia de hoja de coca. Los resultados muestran que la extensión total ocupada por coca en el contexto nacional, por tercer año consecutivo, continúa reduciéndose. Al 31 de diciembre, el espacio ocupado alcanzó las 42,900ha, es decir 13.9% menos en comparación al registrado en el año 2013 (49,800ha). Las mayores extensiones se concentran en el VRAEM |9| con 18,845ha y La Convención y Lares con 10,342ha que en conjunto representan 68.0% del total nacional. Para la determinación de la extensión se ha contado con productos satelitales de alta resolución espacial (SPOT 6/7 de 1.5 m de resolución espacial) registrados entre los meses de agosto a noviembre del 2014. El procesamiento de estos productos y la sistemática verificación aérea (geo video y videos de alta definición efectuados por la FAP), han permitido que la delimitación poligonal y la medición de la extensión ocupada por coca, mejore sustancialmente los niveles de precisión y detalle, por lo tanto, los resultados obtenidos para el año 2014 son de mayor aproximación. La reducción de la extensión registrada en el 2014, en gran medida es consecuencia de las acciones de erradicación planificadas por el Estado Peruano (DEVIDA) y ejecutadas a través del CORAH. De acuerdo a los datos reportados por esta entidad, estas acciones se han venido dando bajo dos perspectivas. Hasta el año 2011, en que se registró la más elevada extensión desde el año 2000 (62,500ha), la erradicación se habría orientado primordialmente a contener la ampliación de los espacios al cultivo de coca, promovidas y exigidas por el narcotráfico, para abastecer una mayor y creciente demanda de los mercados de consumo de cocaína (Europa y Norte América, principalmente) y sobre todo por los requerimientos de los nuevos mercados en América Latina, Asia y África. Consolidada la contención al incremento de áreas, a partir del 2012, la estrategia se orientó a la reducción efectiva del espacio dedicado al cultivo, para ello, el Gobierno decidió incrementar sustancialmente las metas anuales de erradicación hasta alcanzar las 31,205ha en el 2014. 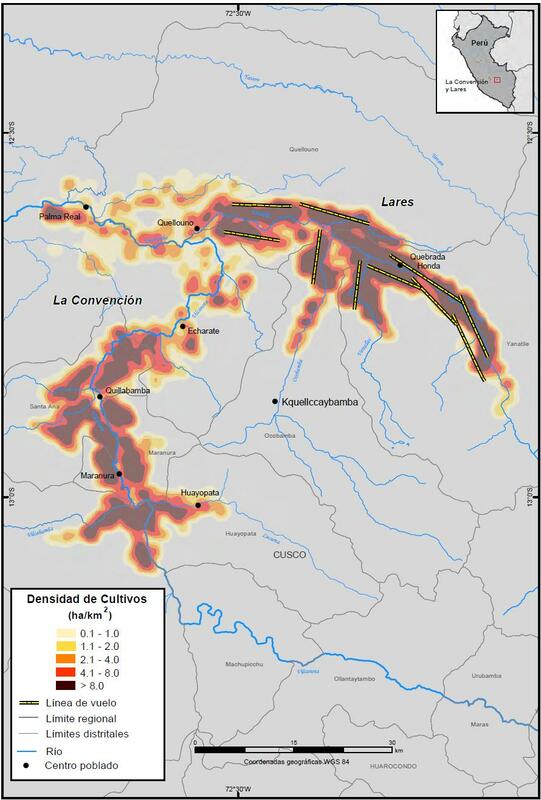 Paralelamente se amplío la cobertura interviniendo zonas emblemáticas donde la producción de hoja y derivados de coca evidencian una vinculación con el narcotráfico como es el Pichis-Palcazú-Pachitea, Aguaytía, Alto Huallaga sector norte, Orellana y Caballocha-Cushillollococha (Bajo Amazonas - Trapecio Amazónico) y de aquellas de alto riesgo donde esta ilícita actividad por muchos años se desarrolló al amparo de la subversión como lo es el Monzón, Alto Huallaga sur) , sector que por muchos años ha constituido una suerte de "zona liberada" al TID |10|. Es importante resaltar que las estrategias de pre-erradicación |11| y las acciones de apoyo social de parte del Estado Peruano (DEVIDA) contribuyeron a una intervención exitosa, incluso en zonas de alto riesgo como el señalado, es así que los conflictos sociales y las protestas no han tenido la magnitud esperada. En estos tres años (20122014) se ha logrado una reducción de casi el 30% con referencia al 2012(60,400ha). Otro factor que por segundo año ha contribuido a la reducción del espacio dedicado al cultivo de coca lo constituye el abandono temporal en la zona de La Convención y Lares. En el 2013, se abandonó el 13.7% del total existente, en el 2012 (12,558ha), en el 2014 ha sido de 4.6% en comparación a la extensión existente en el 2013 (10,843ha). Al igual que el año anterior, la mayor incidencia del abandono se da en la cuenca de Yanatile, aunque es visible también en otras localidades de esta zona cocalera. Es atribuida a la elevada demanda y mayor cotización de los jornales que requieren las obras emprendidas por los gobiernos locales, regionales y las empresas vinculadas a la explotación del gas de Camisea |12|. Las propuestas salariales superan ampliamente lo pagado por la agricultura legal y la dedicada a la coca, lo que ha generado que una parte importante de agricultores se incorporen a esta convocatoria, descuidando o dejando de lado estas dos actividades. Las zonas que registraron ampliación del espacio dedicado a la coca en el 2014, han sido Kcosñipata (19.1%), Marañón (6.5%) y San Gabán (5.9%), en comparación a lo registrado en el 2013. En los casos de Kcosñipata, San Gabán, tendría como respuesta una mayor demanda de pasta básica de cocaína, la misma que tiene como destino intermedio la frontera Estado Plurinacional de Boliviana antes de ingresar a territorio brasilero. En el caso del Marañón, es la misma que en las zonas señaladas pero a diferencia de ellas tiene como principal destino la ciudad de Chiclayo para posteriormente ser enviada al puerto de Paita en Piura y a hacia territorio ecuatoriano. La reducción de los espacios dedicado a la coca, básicamente se han dado en las zonas intervenidas por el CORAH. 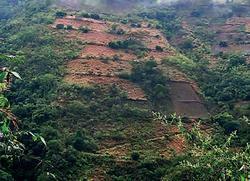 En orden de magnitud de esta reducción tuvo mayor impacto en Aguaytía, Alto Huallaga (incluido Monzón), Pichis-Palcazú-Pachitea, Orellana, y Caballococha. En el año 2013, estas zonas de manera conjunta registraron 10,410ha, al año 2014, la extensión se redujo a 4,446ha, lo que representa una menor extensión equivalente a 57.3%. Las demás zonas de producción existentes en el contexto nacional como el VRAEM, La Convención y Lares, Inambari Tambopata entre otros, mostraron una relativa estabilidad con referencia al año 2013. La producción nacional de hoja seca de coca en el 2014 fue 100,840TM. De este total, según el INEI, 9,000 TM de hoja corresponden al consumo tradicional. El volumen restante de 91,840TM se articula al narcotráfico para ser transformada en pasta básica y clorhidrato de cocaína. La mayor zona productora por muchos años es el VRAEM. El cultivo es manejado con una alta tecnología. En comparación a otras zonas productoras registra rendimientos promedio superiores a 3.5 TM/ha de hoja obtenidas en 4 o 5 cosechas al año. Por lo señalado el volumen total de hoja producido en el VRAEM representa el 67.8% del total nacional. Los más bajos índices se dan en el Alto Chicama con rendimientos de alrededor de 0.8TM/ha. El rendimiento promedio nacional calculado para el 2014 es de 2.35TM de hoja seca por hectárea. 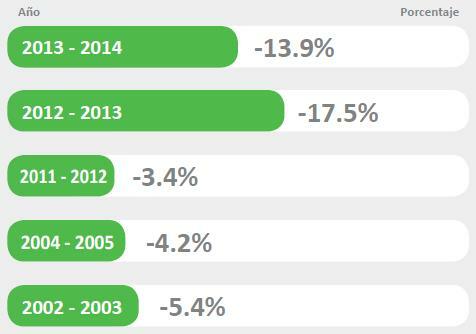 Con referencia a la cotización de la hoja de coca seca, en el año 2014, al igual que en el 2013, se pagó en promedio US 4.3/Kg, precio bastante bueno si lo comparamos con los pagados entre el 2008 al 2012 que en promedio bordearon los 3.3 US/kg. Como se señaló el año anterior esta alza responde a un "efecto globo" interno propiciado por la reducción sustancial de las áreas de producción y la consecuente menor oferta de hoja. La cotización más alta como siempre se registró en el Monzón con 5.2 US/kg y el más bajo en el VRAEM con 3.7 US/Kg. Al respecto, en el VRAEM hasta el año 2012 se pagó por la hoja los precios más bajos oscilando entre 2.7 a 2.8 US/Kg. A partir del 2013 recién supera la barrera de los 3.0 US/Kg de hoja, incentivada por la mayor demanda. Respecto a los precios promedio de los derivados de coca, en el 2014 la pasta básica, se cotizó en 843.0 US /Kg. Comparado con lo pagado en el 2013 (863.0 US/Kg) muestra una variación menor de 2.3%, lo que indica una relativa estabilidad. Por el clorhidrato de cocaína se llegó a pagar en promedio 1,178 US/Kg en el 2014, precio 10.1% inferior al pagado en el 2013 (US 1,310.0/kg). Esta menor cotización estaría asociada a los niveles de pureza. Es igualmente importante hacer notar que las rutas que emplea el narcotráfico para la salida externa de pasta básica y cocaína en los cinco últimos años han variado, en función a las medidas de control implementadas por el Estado Peruano. Hasta el 2010, fue básicamente terrestre principalmente hacia los puntos de salida en la costa y los puntos de salida fronteriza hacia territorio Estado Plurinacional de Bolivia. 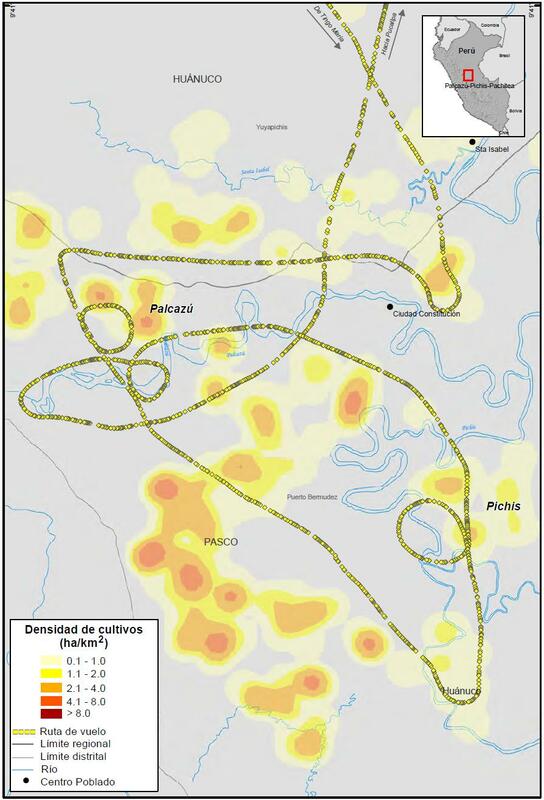 En el año 2011, se reinicia la salida aérea inicialmente desde la zona del Pichis-Palcazú-Pachitea. Para dicho año (2011) UNODC detectó la existencia de 49 pistas clandestinas y 77 para el 2012. Al igual que las rutas terrestres los vuelos tenían como destino intermedio Estado Plurinacional de Bolivia para posteriormente acceder a territorio brasilero. A inicios del 2013, el Gobierno logra desactivar el 80% de ellos. Esto generó que este tipo de salida se traslade hacia el VRAEM. UNODC para el mes de octubre del 2014, detectó en esta zona la existencia de 80 pistas de este tipo. Los vuelos igualmente tienen como destino final Brasil vía Estado Plurinacional de Bolivia. Por último, en los dos últimos años se habrían intensificado igualmente las salidas externas de droga a través de los puertos del Callao y Paita entre otros, tal como reporta la DIRANDRO y los diferentes medios de comunicación. Los reportes también indican que los "narcotraficantes" han logrado un alto grado de penetración en ambos puertos lo que les permite introducir volúmenes importantes de droga en contenedores listos a ser embarcados a un destino de interés y que conocen de antemano. A través del Programa Global de Monitoreo de Cultivos Ilícitos (ICMP, por sus siglas en inglés), con sede en Viena, UNODC apoya a los estados miembros en la generación de información cartográfica y estadística referente a la evolución anual de cultivos ilícitos. Actualmente tiene establecidos estos sistemas de monitoreo en Afganistan, Myanmar, Laos PDR, México, Colombia, Perú, Estado Plurinacional de Bolivia y Ecuador. El Sistema de Monitoreo implementado en el Perú inició operaciones en el año 1999, teniendo como contraparte nacional a DEVIDA, que es la entidad del Estado encargada de diseñar, coordinar e implementar políticas y actividades dirigidas al control de drogas. La información generada anualmente por el Sistema, es considerada como "dato oficial" y constituye el principal referente que emplea el Estado Peruano para conocer las variaciones anuales de la extensión ocupada por coca en el contexto nacional, la producción potencial y precios de la hoja y derivados de coca (pasta básica, clorhidrato de cocaína). Por otro lado posibilita a las entidades del Estado con responsabilidad en el tema, medir y/o evaluar el impacto de los programas de control y/o desarrollo implementados en el marco de la Estrategia Nacional de Lucha Contra las Drogas 2012-2016, y de ser necesario replantearlos en función a la mayor o menor intervención del cultivo. 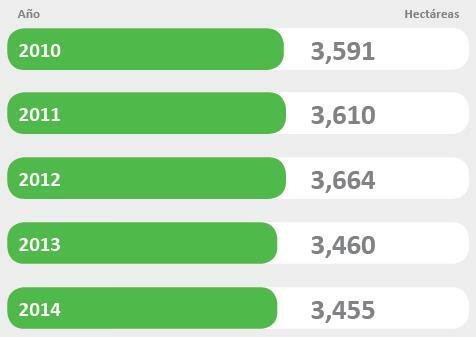 Los datos reportados por el Sistema de Monitoreo primordialmente están referidos a cultivos de coca en producción. Los cultivos de reciente instalación y/o menores de 1 año son incorporados y medidos al año siguiente. Los procesos de detección satelital y dimensionamien-to de los espacios ocupados por coca se efectúa bajo normas establecidas por el ICMP, las mismas que son acordadas con el Gobierno del Perú. Este consenso permite que los resultados obtenidos tengan el sustento y respaldo técnico requerido así como la neutralidad y transparencia para su publicación y difusión. El Sistema de Monitoreo técnica y metodológicamente se sustenta en tres aspectos básicos. El primero de ellos tiene que ver con el procesamiento de productos satelitales, para la detección espectral y delimitación de los espacios geográficos ocupados por cultivos de coca y en función a ello la elaboración de mapas preliminares. El segundo componente está dirigido a la verificación aérea de los procesos de detección efectuados en gabinete. Para este objetivo en los dos últimos años se viene empleando videos de alta definición registrados por sensores EO STAR SAFIRE FLIR HD de la Fuerza Aérea del Perú. Este tipo de cobertura es de carácter muestral y registrados en líneas de vuelo preestablecidas para cada una de las zonas de producción cocalera. Para este fin también se ha contado con Geo Videos tomados desde avionetas a una altura de vuelo de 1,500 pies. Toda esta información es correlacionada con los mapas preliminares, determinando los niveles de coincidencia o no, de los espacios clasificados como coca. En función a este proceso se efectúan los ajustes y correcciones respectivas. En la tercera y última etapa se correlaciona la información corregida con la información poligonal de erradicación ejecutada por el CORAH y se elaboran los mapas digitales definitivos y el dimensionamiento a nivel de zonas de producción y nivel nacional. Para la detección y delimitación de cultivos de coca correspondiente al 2014, se han empleado productos satelitales SPOT 6/7 de resolución espacial de 1.5m. La alta resolución espacial ha permitido una detección más precisa de las plantaciones de coca en sus diferentes estadios y un mayor ajuste en la delimitación poligonal de los espacios que ocupan. Por lo señalado, es probable que la medición de la extensión de coca en algunas zonas de producción donde no se han efectuado acciones de erradicación, ni tampoco abandono de cultivos, muestre ligeras variaciones. Para el cálculo del volumen total de hoja producida en el contexto nacional, UNODC dispone y emplea datos de rendimientos de hoja por hectárea para cada una de las zonas de producción. Esta información fue registrada en el año 2004 - 2005. En el entendido que la tecnología de manejo del cultivo ha mejorado en los últimos años, DEVIDA en el 2014, ha encargado la ejecución de un trabajo de este tipo a nivel nacional con el fin de ser actualizados. A la fecha se tienen resultados preliminares para algunas zonas y para fines del 2015 se espera contar con información de otros sectores y así tener un cálculo de mayor aproximación de la producción potencial de hoja. En lo que respecta a la producción potencial de clorhidrato de cocaína, UNODC, desde el 2008 no presenta este dato, debido a que considera que los requerimientos de hoja de coca para la obtención de un (1) Kg de cocaína, actualmente son muy inferiores a los que han venido empleando (375 Kg de hoja x 1 Kg de cocaína). Con el fin de superar esta deficiencia entre los años 2012 y 2014, UNODC a través de los proyectos PRELAC I y II y un convenio con DEVIDA (financiado por el gobierno francés), ha llevado a cabo trabajos especializados con el fin de determinar los factores de conversión de hoja de coca-cocaína. Este proceso incluye tres temas. El primero de ellos, está dirigido a la entrevista a "químicos o cocineros" que han dirigido procesos químicos de transformación de hoja de coca-cocaína. El segundo tema a la validación de los resultados obtenidos a través de la simulación de los procesos de transformación en campo y el tercer tema, a la determinación de la pureza de la cocaína obtenida. El primer tema fue concluido en su integridad llegándose a entrevistar en total a 130 "cocineros" y se dispone de resultados preliminares que confirmarían menores requerimientos de volúmenes de hoja. El segundo y tercer tema no se han ejecutado debido a que aún no se ha logrado el levantamiento de las restricciones legales que autoricen su ejecución. 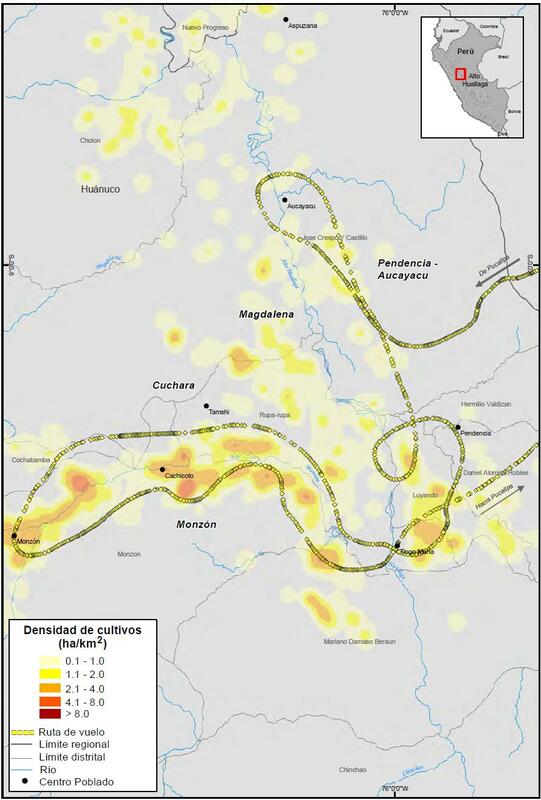 Otro aspecto importante que ha abordado el Sistema, es lo referente a la detección satelital de pistas clandestinas que emplea el narcotráfico para la salida aérea de los derivados de coca que se producen en la zona y en otras zonas cocaleras. El primer trabajo se efectúo en la zona del Pichis-Palcazú en el año 2012. En base a esta información se estructuró una base de datos debidamente georeferenciada. A inicios del 2013 el Sistema actualizó esta información y de acuerdo de su estado de uso las clasificó como pistas operativas, desactivadas, rehabilitadas y nuevas. UNODC continúa con este trabajo en el VRAEM y Aguaytía entre otras. En el 2013, mediante la información satelital disponible, se realizó un trabajo que tuvo como objetivo detectar, dimensionar y ubicar cartográficamente la presencia de minería ilegal en ámbitos de producción cocalera. El primer trabajo de este tipo se efectúo en San Gabán. 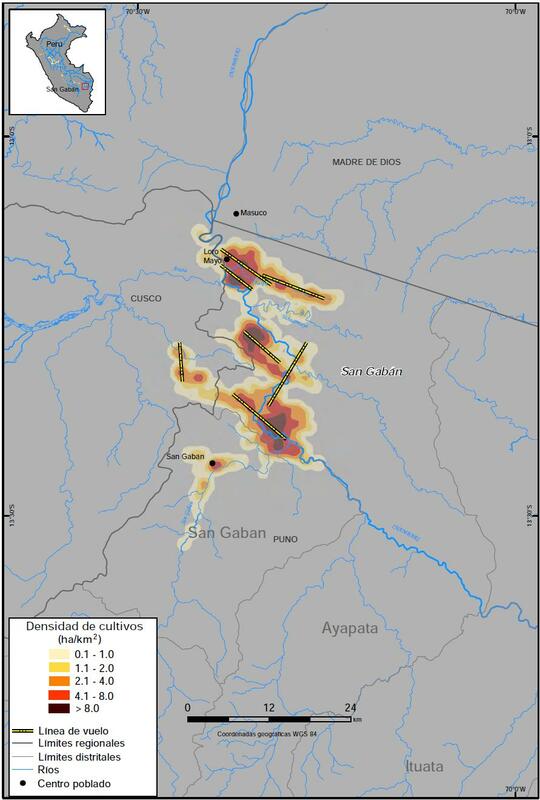 En los últimos cinco años, la actividad cocalera en el Perú ha registrado cambios importantes en aspectos que tienen que ver, no solo con las variación de los espacios geográficos ocupados por el cultivo, sino también con temas vinculados a las modalidades y origen de las organizaciones dedicadas al TID; en la diversificación de las rutas que se vienen empleando para la salida externa de la producción local de derivados de coca y en los requerimientos de hoja y la optimización de los procesos transformación química para la obtención de cocaína. Respecto a la extensión ocupada por coca, después de muchos años de crecimiento continuo, a partir del 2012, se registra una primera reducción en rangos porcentuales mínimos a 3.4%; sin embargo, el siguiente año (2013), esta reducción alcanza niveles sin precedentes de 17.5%, tendencia que al parecer se viene haciendo sostenida corroborado por los resultados obtenidos para el año 2014 (13.9%). Indudablemente la reducción de los espacios dedicados al cultivo por tres años consecutivos, obedece a la decisión del Gobierno Peruano de ampliar la cobertura de las acciones de erradicación ejecutadas a través del CORAH sobre todo por intervenir las zonas más emblemáticas en la producción de hoja de coca con evidente articulación al narcotráfico; y asimismo, la intensificación de la atención de estas zonas con proyectos y actividades de desarrollo alternativo. 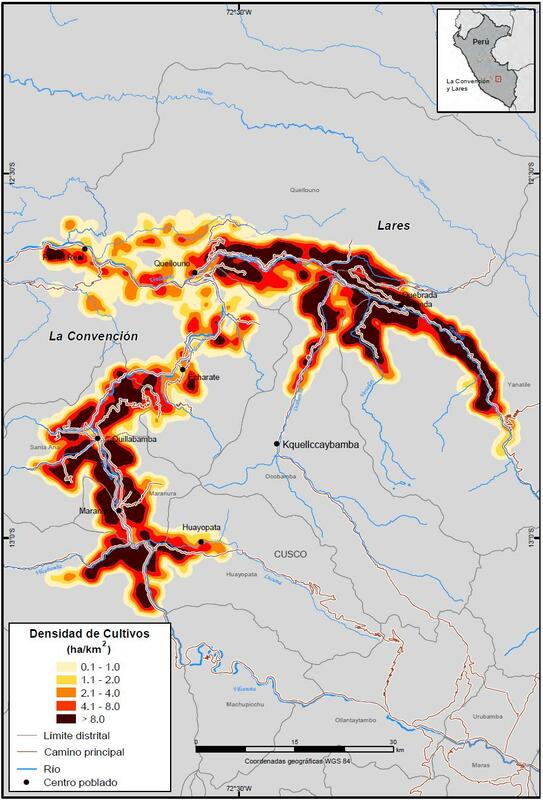 En efecto, en este periodo (2012-2014) el CORAH intervino la zona sur del Alto Huallaga (región Huánuco), en el que incluyó el Monzón, una suerte de zona liberada y el más importante bastión donde la producción de hoja de coca históricamente estuvo asociada con el narcotráfico y la subversión. Esta alianza estratégica hizo que la población involucrada en el cultivo rechace violentamente cualquier tipo de presencia y participación del Estado y/o la Cooperación Internacional con programas de desarrollo, por lo tanto, era difícil de pensar que las acciones de erradicación se darían en un marco de mínima seguridad. A pesar de esta situación, como resultado de adecuadas políticas de pre-erradicación implementadas por el Estado (DEVIDA), se logró una intervención sin los riesgos esperados eliminándose alrededor del 90% del área en producción, ello propició que el Alto Huallaga, en lo que a extensión se refiere, pasara a un quinto lugar después del VRAEM y La Convención y Lares. Otras zonas intervenidas por el CORAH en este periodo, han sido las zonas de producción importantes por su articulación con el narcotráfico, como son el Aguaytía (región Ucayali), Pichis-Palcazú-Pachitea (Región Pasco), Orellana y Caballococha (región Loreto). Esta última ubicada en un sector estratégico (Trapecio Amazónico), por su cercanía fronteriza a Colombia y Brasil. Lo relevante de las acciones de erradicación es que en estos tres años han logrado resultados contundentes traducidos en una reducción de alrededor de 30% de la extensión registrada en el 2012 a nivel nacional (60,400ha). Con referencia al origen de las organizaciones dedicadas al TID y las modalidades de intervención en el Perú, hasta el año 1995, estas tuvieron una fuerte presencia en las zonas de producción. A partir del indicado año este tipo de intervención disminuye básicamente por dos factores: el primero de ellos resultante de la desactivación de las numerosas pistas clandestinas existentes a lo largo del territorio nacional, accionar que cortó el principal y mayor flujo de salida de los derivados de coca. El segundo factor se da como consecuencia del primero, la extensión ocupada por coca en Colombia se incrementó sustancialmente hasta alcanzar las 129,000ha en el año 1999. En estas circunstancias la demanda colombiana se redujo sostenidamente y generó una fuerte caída de los precios y una intensa recesión de la oferta lo que propicio el abandono del 70% en las zonas de producción cocalera en Perú. A partir del año 2000, al incrementarse la demanda internacional de cocaína (mayor consumo en Europa, Asia, África y recientemente Latinoamérica), la extensión ocupada por coca en el Perú de igual modo se incrementó hasta alcanzar en el 2011 las 62,500ha. El TID opera de diferentes maneras y manejan la captación de la droga requerida desde las principales ciudades de la costa con muy escasa o ninguna presencia en las zonas productoras. Al parecer, los riesgos que implica la contratación de los "pedidos" de pasta básica o cocaína, el acopio y el traslado respectivo han sido transferidos a "clanes familiares", "cárteles criollos" y/o pequeños y medianos acopiadores que además son los encargados de armar los "stocks" solicitados. Es decir, las organizaciones mexicanas, que predominan hasta la fecha, han fragmentado los servicios de transformación, acopio, transporte y almacenamiento de la droga, desde las zonas de producción, hasta llegar a los puntos de salida externa. En ese contexto, el tráfico ilícito de drogas (TID) en sus distintas modalidades ha incorporado vastos sectores de la población peruana articulándola a circuitos, ciclos y cadenas productivas de la hoja y derivados de coca (pasta básica y clorhidrato de cocaína). Esta situación ha propiciado la circulación y disputa de mucho dinero y por lo tanto, la aparición y predominancia de un narcotráfico más violento en torno a él. Los ajustes de cuentas y asesinatos se han hecho más notorios, la corrupción y lavado de activos se han acentuado, no solo en los grandes centros urbanos de la costa, sino en las ciudades intermedias y cuencas cocaleras donde transita y se produce la droga. Respecto a las rutas de salida externa, también se han registrado cambios importantes. Hasta el 2008, la salida marítima era uno de los principales medios para acceder a los mercados europeos, asiáticos y africanos. Entre este año y finales del 2010, sin dejar este medio, se incrementó considerablemente el flujo de salida terrestre en su mayor volumen hacia la zona sur este del territorio nacional correspondiente a las regiones de Madre de Dios y Puno para ingresar al Estado Plurinacional de Bolivia y desde este país mayormente hacia el Brasil. Esta variación, se da por el significativo incremento de la demanda de pasta básica de cocaína como consecuencia del creciente y elevado consumo del "crack |13|" y "oxi |14|", productos que se elaboran a partir de la pasta básica. 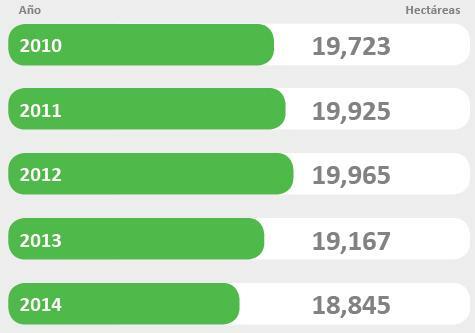 Según estadísticas de dicho país, Brasil lidera el ranking mundial de consumo de crack con casi 1,2 millones de consumidores. Estos datos se conocen a partir de una investigación reciente realizada por la Universidad Federal de Sao Paulo. Las cifras estimadas por la Comisión de Seguridad de la Cámara de Diputados y de la Policía Federal indican que en el país se consume, en promedio, una tonelada de droga por día, en una industria que mueve aproximadamente US$ 10 millones diarios. En el año 2011, al igual que antes de 1995, se reanudó la salida aérea de derivados (pasta básica), inicialmente desde la zona de Pichis-Palcazú. Para dicho año, UNODC Perú, detecto la presencia de 10 pistas clandestinas implementadas para este fin. En el 2012, el número se elevó a 49 y a mediados del 2013 alcanzó las 67 pistas. A inicios del 2013 el Gobierno Peruano inicia un programa de destrucción de pistas clandestinas en el Pichis-Palcazú, logrando desactivar más del 80% de ellas |15|. Esto generó que en el 2013 este tipo de salida aérea se traslade hacia la zona del VRAEM la más grande en extensión (19,167 ha) y en producción de derivados de coca (más del 50% del total nacional). UNODC para el 2014 (Setiembre/Octubre), detectó la existencia de 80 pistas de este tipo. Los vuelos igualmente tienen como destino final Brasil vía Estado Plurinacional de Bolivia. En los dos últimos años se habría intensificado la salida externa de droga especialmente a través de los puertos del Callao y Paita entre otros, tal como reportan la DIRANDRO y los diferentes medios de comunicación. Los reportes también indican que los "narco-exportadores" han logrado un alto grado de penetración en ambos puertos, lo que les permite introducir volúmenes importantes de droga en contenedores ("contenedores preñados"), listos a ser embarcados a un destino de interés y que conocen de antemano. En cuanto al cultivo, en los últimos diez años el manejo tecnológico ha mejorado sustancialmente sustentado en principio, por el incremento de la densidad plantas por hectárea y segundo por el uso cada vez mayor de agroquímicos lo que al parecer ha logrado incrementar los rendimientos de hoja y serían en la actualidad superiores a los que se viene empleando para el cálculo de la producción potencial de hoja. Al respecto en el 2014, DEVIDA ha encargado la ejecución de trabajos de este tipo en cuatro importantes zonas cocaleras. Se espera que en el 2015 se amplíe la cobertura hacia otras zonas productoras, que posibilite disponer de datos representativos para todo el contexto nacional y efectuar los cálculos respectivos con un mayor nivel de aproximación. Otro aspecto que ha registrado cambios son los requerimientos de hoja seca para la obtención de un kilo de cocaína pura. Al respecto, UNODC a través del proyecto PRELAC I (2009), del Convenio UNODC/DEVIDA (2012/2013) y PRELAC II (2014), logró entrevistar a 130 "químicos" o "cocineros", quienes han dirigido procesos de transformación química coca - cocaína. Cada uno de ellos aportó información acerca de las cantidades de hoja, insumos químicos básicos y alternativos empleados en estos procesos. 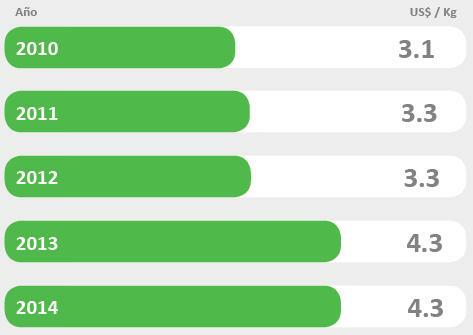 Los resultados, si bien aún son de carácter preliminar, señalan una reducción importante de los requerimientos. Esto significaría que el valor de 375kg/hoja |16| por 1Kg de cocaína que empleó UNODC para calcular la producción potencial de cocaína hasta el 2008, se habría modificado y seria en la actualidad mucho menor. Esta data aún no es empleada para efectuar los cálculos respectivos debido a que requiere de la simulación de los procesos en campo y el análisis de pureza de la cocaína producida (validación). Para llevarla a cabo se necesita y está pendiente el levantamiento de restricciones legales, las mismas que vienen siendo gestionadas por DEVIDA. El hecho de ampliar considerablemente la cobertura y dimensión de las acciones de erradicación en estos tres últimos años, manifiesta la decisión del Gobierno Peruano no solo para reducir significativamente el espacio geográfico dedicado al cultivo, sino un medio para reducir la oferta de derivados de coca (pasta básica y Clorhidrato de Cocaína) que el narcotráfico y el mercado internacional demanda. Analizando las cifras de erradicación reportadas por el CORAH, en los últimos 10 años (2005-2014) se puede señalar que los primeros siete años (2005-2011) la principal función de la erradicación fue la contención, que evitó una mayor expansión del cultivo, incremento sustancial propiciado y requerida por una mayor demanda de derivados de coca. Es necesario recordar que de no ser así, la extensión ocupada podría haber alcanzado mayores niveles de expansión. 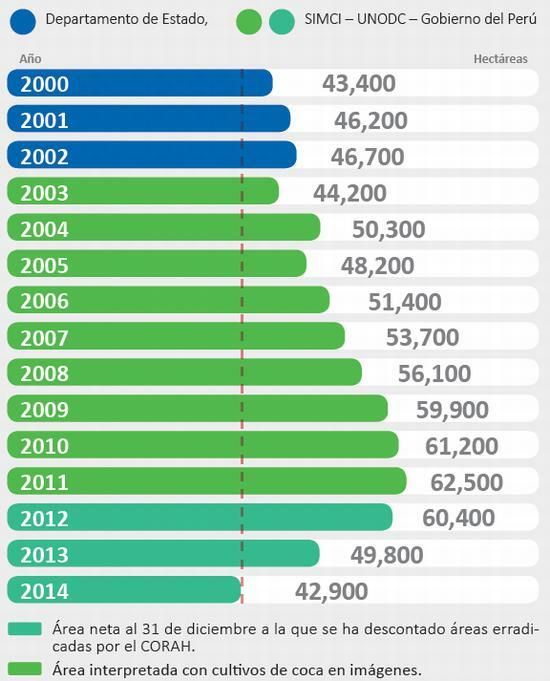 Entre el 2005 al 2011, se logró erradicar 79,588ha. La extensión ocupada por coca en dicho periodo se incrementó con una tasa promedio anual de 2.3%. Entre los años 2012 y 2014 se erradicó un total de 69,310ha, y contrariamente a lo sucedido en los siete años anteriores, el espacio ocupado por el cultivo de coca en el Perú se redujo alrededor de 30%. La relevancia de estas acciones, a pesar de los riesgos implícitos que la acompañan, ha sido la intervención de las zonas más hostiles y peligrosas como es el Monzón, donde la población (estable y "golondrina") involucrada en el cultivo, ha desarrollado sostenidamente esta actividad al amparo del narcotráfico y la protección de la subversión. La erradicación y la implementación de acciones de desarrollo alternativo, así como el acercamiento del Estado hacia las zonas cocaleras implica un gran esfuerzo de las autoridades nacionales, que debe intensificarse para dar sostenibilidad a la reducción del espacio cocalero y dar pase al desarrollo de estas zonas, asistiendo a estas comunidades vulnerables, en la mitigación de la actividad cocalera ligada al narcotráfico. Si bien es cierto que la medición anual del área intervenida por coca es un indicador importante, también es cierto que esta información correlacionada con la data actualizada de rendimientos de hoja y de los actuales requerimientos de hoja para la obtención de clorhidrato de cocaína (factores de conversión) permitiría definir la real dimensión del problema no solo en el Perú sino en los otros países productores de la región. De confirmarse los resultados preliminares en torno al incremento de los rendimientos de hoja por hectárea y la reducción de los requerimientos de hoja de coca para la elaboración de cocaína, estaríamos enfrentando un problema de mayor dimensión a pesar de los evidentes éxitos logrados por la erradicación. Actualmente el TID en el Perú, opera desde las principales ciudades de la costa y ha transferido toda la logística necesaria en torno a él. Esto ha propiciado que se formen numerosos "clanes familiares", "carteles criollos" y delincuentes comunes y corrientes que han asumido estas "tareas". En la actualidad de acuerdo a lo reportado por la DIRANDRO, el 80% de la producción de derivados se movilizaría principalmente por tres frentes. El primero de ellos, teniendo como punto de partida el VRAEM, se traslada por vía aérea y terrestre pasta básica hacia el mercado brasilero vía Estado Plurinacional de Bolivia. El segundo a través de los puertos marítimos donde primordialmente se traslada clorhidrato de cocaína hacia mercados de Europa, África, Asia y el tercero a través del río Amazonas partiendo del Trapecio Amazónico hacia el territorio de Brasil. Al 31 de diciembre del 2014, la superficie ocupada por cultivos de coca, alcanzó una extensión de 42,900ha. Este resultado es 13.9% menor al registrado el año 2013 (49,800ha) lo que indica que las políticas de control implementadas por el Estado Peruano por tercer año consecutivo (2012-2014) han logrado reducir el área de producción en un porcentaje acumulado del orden del 30% con referencia a la extensión existente en el año 2012 (60,400ha). El área en producción en el presente informe, alcanzó la dimensión más baja en lo que va del presente siglo (año 2,000- 43,400ha). Es necesario señalar que el total determinado para el 2014, incluye la extensión destinada al consumo tradicional (chacchado o masticado). Sobre esto, cabe recordar que en el 2004, un estudio de INEI |17| llegó a la conclusión de que la demanda de hoja para el consumo legal era de alrededor de 9,000TM. Los cálculos realizados por DEVIDA indican que esta cifra correspondería a un área aproximada de 6,700ha. Se considera que a la fecha estos cálculos definitivamente han variado y se hace necesario actualizarlos con el fin de determinar el volumen total de hoja que es derivado al narcotráfico. En la figura 1, se aprecia que desde el año 2000, la extensión ocupada por coca con ligeras variaciones, mantuvo una tasa de crecimiento constante del orden 1.7% anual. XXXX Área neta al 31 de diciembre a la que se ha descontado áreas erradicadas por el CORAH. A partir del 2012 se da un punto de quiebre y se inicia un decrecimiento al parecer sostenido con una tasa promedio anual de menos 11%. Se espera que los próximos años se mantenga esta tendencia; para ello, la erradicación debe seguir siendo complementada con intervenciones de desarrollo alternativo y con un efectivo control de insumos químicos, debido a que como se ha señalado, los procesos de transformación hoja de coca-cocaína se han optimizado y alcanzado un elevado nivel de eficiencia. Como se observa en el cuadro N� 1, las zonas que registraron reducciones del área de producción con referencia al año 2013 por efectos de la erradicación fueron en orden de importancia Aguaytía con 81.5%, Alto Huallaga con 63.9%, Otros en el que se incluye la localidad de Orellana 58.9%, Pichis-Palcazú-Pachitea 53.4%, Bajo Amazonas (Caballococha) 30.4%. También se redujo el área de producción en La Convención y Lares en un nivel de 4.6%, esto no fue consecuencia de acciones de erradicación sino por efecto del abandono voluntario. 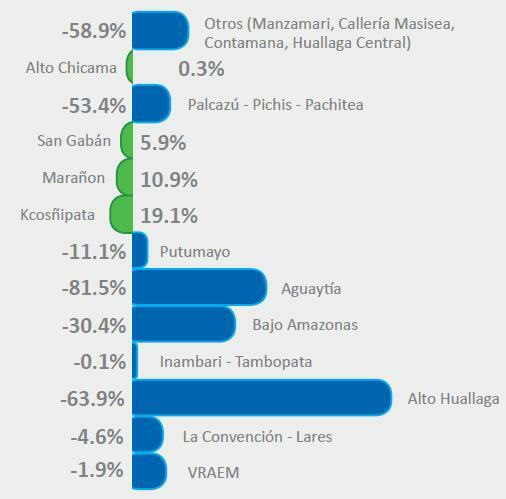 Las que registraron ligeros incrementos de área fueron en primera instancia Kcosñipata en el Cusco con 19.1%, Marañón 6.5% y San Gabán 5.9%. Las variaciones en las demás zonas en el que se incluye al VRAEM y Putumayo fueron debido al ajuste de la detección y delimitación poligonal por el empleo de escenas satelitales de mejor resolución espacial. También se observa en dicho cuadro que el VRAEM y La Convención y Lares a pesar que no registraron incrementos de áreas continúan siendo para el año 2014 las más extensas y representan en conjunto el 68.0% del total existente en el contexto nacional. 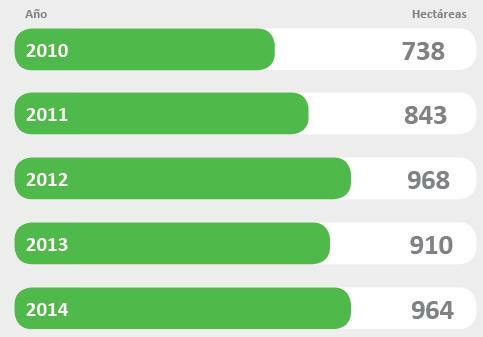 Este porcentaje es superior al registrado en el 2013 (60.3%). La significativa y relevante reducción registrada en el periodo (2012-2014) , es consecuencia del incremento sustancial de las metas anuales de erradicación ejecutadas por el CORAH; de la ampliación de la cobertura de dichas acciones y la implementación de estrategias de pre y post erradicación (DEVIDA), que han posibilitado la intervención exitosa no solo de zonas cocaleras emblemáticas de evidente articulación al narcotráfico sino de aquellas consideradas de alto riesgo y de violencia predominante por el hecho que la actividad cocalera y de transformación en derivados se da además, bajo la protección de la subversión como históricamente ha ocurrido en el Monzón. Las manifestaciones de rechazo de la población dedicada a este cultivo, los conflictos sociales y ataques al personal del CORAH, si bien es cierto se han dado, pero no en la dimensión esperada. En el año 2014, el CORAH intervino las zonas de producción del Alto Huallaga (Bolsón San Martín, Aucayacu, Bolsón Cuchara, La Merced de Locro, Monzón (Cachicoto, Bella), Aguaytía (Irazola, Padre Abad, Curimana, Tournavista, Campo Verde), Pichis-Palcazú-Pachitea (Ciudad Constitución), Contamana (Orellana), Bajo Amazonas (Caballococha). Lo resaltante de estas acciones en el presente año es que por primera vez ha sido intervenido el Bajo Amazonas (Trapecio Amazónico) que por su lejanía y difícil acceso, en los últimos años incrementó significativamente el área dedicada a coca y donde el narcotráfico opero sin mayores restricciones. Las acciones de erradicación en Aguaytía se han dado durante los años 2011, 2012 y 2014; en el Alto Huallaga de manera consecutiva desde el año 2009 hasta el 2014; en el Monzón del 2012 al 2014; Pichis-Palcazú-Pachitea del 2012 al 2014; en el Bajo Amazonas (Caballococha) y Contamana (Orellana) en el año 2014. Como consecuencia estas zonas intervenidas muestran en la actualidad predios, otrora ocupados por coca, invadidos de maleza de porte herbáceo y/o arbustivos de escasa o mínima posibilidades de uso pecuario. La presencia de cultivos de coca en producción se ha reducido al mínimo y ocupan espacios inferiores a una hectárea. En el año 2014, trece (13) de las veinticinco (25) regiones del Perú, registran la existencia de cultivos de coca. Como en años anteriores, la región Cusco registra la más alta extensión que se distribuye entre las zonas de La Convención y Lares y el VRAEM. 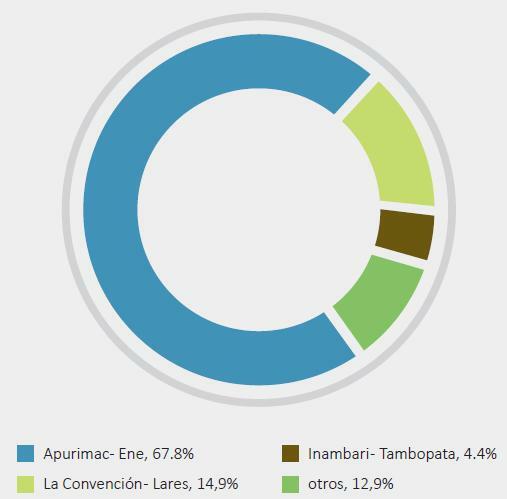 El segundo lugar sigue siendo ocupando por la región Ayacucho, que en conjunto representan alrededor del 62.5% del total existente en el contexto nacional. Ambas regiones no han sido intervenidas por la erradicación, la que pueda modificar el orden de importancia en lo que ha dimensión se refiere. Uno de los casos es el de Loreto, que en el año 2013 ocupaba el tercer lugar; actualmente, está ocupando la quinta posición por efecto de la erradicación en Caballococha. De las trece regiones intervenidas por el cultivo, solamente la región Cusco y en especial la zona de La Convención y Lares, puede ser considerada como productora de hoja para el consumo tradicional (masticado) y en muy baja escala para uso industrial y farmacéutico. Sin embargo, también se puede afirmar que la producción de hoja de esta zona supera largamente la demanda legal de hoja. La Empresa Nacional de la Coca en el año 2014 acopio aproximadamente 1,900TM de hoja. Se asume que el mayor volumen de hoja producida localmente sale de la zona eludiendo los controles de ENACO para ser comercializada directamente a los distribuidores autorizados. Esta situación ocurre desde muchos años atrás y se da por la diferencia que existe entre lo que se paga al productor con lo que se vende al distribuidor. No se tiene evidencias que parte de este volumen sea dirigido al narcotráfico. 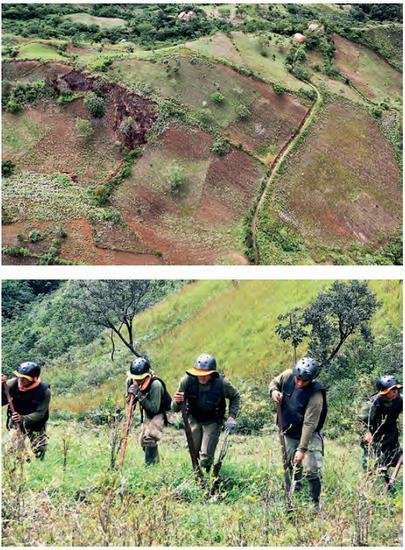 Las regiones que han reducido sustancialmente la extensión dedicada al cultivo de coca en el 2014, son Ucayali, San Martín, Huánuco, Pasco y Loreto. El denominador común de esta menor extensión ha sido la intervención del CORAH. Para el año 2014 la extensión dedicada al cultivo de coca en el VRAEM alcanzó las 18,845ha, Esta cifra comparada con la del año anterior (19,167ha) da como resultado una disminución equivalente al 1.7%. Si bien en esta zona no ha existido sustitución o abandono, ni acciones de erradicación, la menor extensión responde básicamente al empleo de imágenes satelitales de alta resolución y los insumos empleados para la verificación aérea como son el Geo Video y los videos de alta definición registrados por la FAP, que han permitido un mejor ajuste en la medición del área ocupada. La extensión determinada para el VRAEM representa el 43.9% del total existente en todo el ámbito nacional y constituye el área de producción de mayor dimensión. Las mayores concentraciones de cultivos de coca continúan dándose en los distritos de Samugari, Santa Rosa, Llochegua y Canayre. Es válido mencionar que esta zona por su baja dinámica expansiva es considerada como estable, esto debido a que los espacios aptos para este cultivo en su mayor extensión han sido ocupados. Esta condición ha hecho que el productor cocalero opte por el mejoramiento tecnológico del cultivo elevando la densidad de plantas por hectárea (hasta 200,000 plts/ha) |18| y el uso intenso de agroquímicos, lo que ha posibilitado la obtención de rendimientos de hoja en promedio superiores a las 3.6TM/ha/año, la más alta en comparación a otras zonas productoras. Como resultado de esta alta productividad el VRAEM en la actualidad oferta un volumen de hoja de coca equivalente al 67.8% del total producido a nivel nacional. La totalidad de la hoja producida en el VRAEM se articula al narcotráfico y alrededor de ella operan organizaciones de "traficantes criollos" o "clanes familiares" en complicidad y protección de columnas subversivas. La producción local en sus mayores volúmenes sale por dos frentes. El primero de ellos se dirige por vía terrestre al extremo sureste del país (Puno y Madre de Dios) para posteriormente acceder al Estado Plurinacional de Bolivia, teniendo como destino final Brasil. En los dos últimos años y con el mismo destino final se implementó y multiplicó la salida aérea. Esta modalidad de salida externa de derivados, inicialmente se dio en el Pichis-Palcazú, implemen-tándose para este fin numerosas pistas clandestinas (49 pistas en el 2012). A inicios del 2013, el Gobierno Peruano logra desactivar más del 80% de ellas. Esto generó que en el mismo año, este tipo de salida aérea se traslade hacia el VRAEM y se implementen igualmente numerosas pistas clandestinas. Esta tendencia de salida, se sustenta en la creciente demanda de este tipo de derivado propiciado por el creciente consumo de "crack |19|" y oxy |20|" que se registra en el país vecino. Otro tipo de salida es la terrestre hacia los centros poblados de la costa bajo la forma de clorhidrato de cocaína para posteriormente ser embarcada a los mercados de consumo de Europa, África, Asia. Hasta el año 2014 en el VRAEM no se han efectuado acciones de erradicación, lo que sí se da con frecuencia son operativos de interdicción siendo común la destrucción de pozas de maceración y laboratorios de procesamiento de derivados de coca. Cabe señalar que en la localidad de Machente, la PNP cuenta con un scaner para controlar el ingreso vehicular de insumos químicos y salida de derivados de coca. Así mismo se está controlando y racionalizando el ingreso de combustibles que es el principal insumos para el procesamiento de hoja de coca. 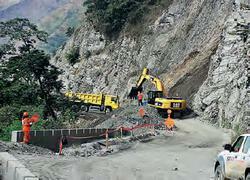 Respecto al VRAEM, es necesario agregar que a partir del Decreto supremo N� 077-2013-PCM, se prueba la intervención del Estado, a través del Programa de inversión Multisectorial del Gobierno central en los valles de los Ríos Apurímac, Ene y Mantaro 2013-2016. A partir de esta iniciativa se genera el Proyecto especial PROVRAEM |21|, aprobado en Consejo de Ministros el 06 de agosto del 2014, cuya finalidad es promover el desarrollo de los poblados de los Valles de los ríos Apurímac, Ene y Mantaro. Uno de los objetivos centrales de esta iniciativa es el reducir el precio de la hoja de coca, a través de acciones de interdicción de insumos químicos, y así asegurar el éxito del programa de reconversión productiva iniciado por el Ministerio de Agricultura y Riego (MINAGRI) en esta zona cocalera. A través de este Proyecto y que en conjunto con AgroIdeas, AgroBanco, INIA y otras entidades se ha puesto en marcha el Plan de Reconversión Productiva y que profundiza el combate frontal contra el narcotráfico. En lo que respecta al primer tema, la meta principal es la sustitución de 5,000 hectáreas de coca, a través de la incorporación voluntaria de la población involucrada en este cultivo, a la que se le brindará alternativas de desarrollo agropecuario y/o forestal y la provisión de infraestructuras, servicios básicos y otras acciones. En lo que compete al segundo tema, se reforzará entre otras, las acciones de interdicción lideradas por la SUNAT, con el fin de cortar el flujo de insumos químicos que emplea el narcotráfico para la transformación de hoja de coca en derivados. A través de esta medida se espera lograr la reducción del precio de la hoja de coca y propiciar el abandono del cultivo y consecuentemente inducir a la población a otras opciones de desarrollo las que serán promovidas por el plan mencionado. Al año 2014, el área afectada con el cultivo de coca asciende a 10,342ha cifra que representa el 24.1% del total nacional cultivado. En contraste al año 2013 (10,843ha) se puede apreciar una reducción equivalente al 4.6%. Si bien se muestra una disminución, es derivada al abandono voluntario, debido a las ofertas de trabajo en obras públicas ejecutadas por los gobiernos locales con un mejor jornal, esta zona sigue siendo la segunda en producción, entendiendo que en ella no se llevan a cabo acciones de erradicación y que parte de su producción se dirige hacia el mercado legal controlado por la Empresa Nacional de la Coca. El abandono del cultivo en esta zona se está dando por los siguientes aspectos: Uno de ellos es la migración de mano de obra del campo a diversas empresas que operan en la Provincia de La Convención, se basa en la remuneración que reciben mensualmente que en promedio pueden estar entre 1,000 a 1,200 nuevos soles al mes, este pago es efectuado por las municipalidades, empresas explotadoras de gas, empresas dedicadas a la construcción de vías, entre otras; sin embargo, este fenómeno en los últimos años, viene acompañado de un factor mucho más importante y es que la nueva generación de jóvenes en la zona de La Convención y Lares ya no desean dedicarse a labores de campo puesto que aspiran a mejores oportunidades laborales de mano calificada con estudios técnicos o superiores, originando que la mano de obra sea escasa en toda esta zona; otro de los aspectos es que habiéndose elevado el costo de la contratación de mano de obra, el agricultor tendría que pagar entre 40 a 50 soles al día en comparación al pago que se hacía en años anteriores que era de 15 a 20 soles, favoreciendo el abandono agrícola. En referencia al consumo tradicional, es bien sabido que la mayor producción de La Convención y Lares se destina al masticado y en menor proporción al uso industrial o farmacéutico. Si bien es cierto los cultivos de coca, no estarían ligados directamente al narcotráfico, se ha podido observar en los últimos años el aumento del cultivo en la zona de Kepashiato, la que aparentemente estaría siendo utilizada en la producción de derivados cocaínicos procesados en el mismo sector, esto viene ocurriendo desde la integración de la carretera Quimbiri - Kepashiato que une el VRAEM con La Convención; de donde estarían ingresando insumos para la elaboración de droga. Un punto a tomar en cuenta es el padrón de ENACO del año 1978; con ello, sería necesario realizar una nueva evaluación que conlleve al sinceramiento de las estadísticas nacionales respecto al cultivo de coca destinado para fines lícitos. Hay que tener en cuenta que el 90% de las adquisiciones de hoja de coca realizadas por ENACO pertenecen a esta zona co-calera. La extensión calculada para esta zona es de 3,455ha, representando el 8.1% del total nacional. En comparación con el año anterior (3,460ha) la variación del área es del orden de -0.1%. Como se puede apreciar en la figura 7, este sector se ha mantenido estable durante los últimos años. Para el año 2014, en la zona del Inambari-Tambopata se preveía registrar un incremento de los cultivos de coca debido al efecto devastador causado por la roya amarrilla |22| en los cultivos de café en la zona, y según la central de cooperativas cafetaleras de Sandia, CECOVASA de 89 mil quintales de café que produjo este sector en el año 2012, se obtuvieron solo 11 mil en el año 2014, lo cual pudo motivar a los agricultores a cultivar coca, sin embargo esto no ha ocurrido y uno de los principales motivos es que se habría optado por la minería ilegal para la extracción de oro, pues en la zona del Alto Inambari es notoria la presencia de espacios intervenidos con dicha finalidad e incluso se ha identificado una pista (dinamitada) en los alrededores, como se puede apreciar en la siguiente imagen. Otro tema preocupante desde el punto de vista ambiental, es el hecho que el 49.7% (1,718ha) de los cultivos de coca existentes es este sector se encuentra dentro de Áreas Naturales Protegidas, para ser más específicos 108ha se encuentran dentro del Parque Nacional Bahuaja Sonene y 1,610ha se encuentran dentro la zona de amortiguamiento. Los registros satelitales empleados en la detección y medición de cultivos de coca han permitido percibir para este año la apertura de chacras nuevas en espacios aparentes para el cultivo. Esto se viene dando incluso dentro de la zona de amortiguamiento del Parque Nacional de Bahuaja Sonene. Se presume que esto se estaría dando por el hecho que el Estado Peruano ha dictado medidas restrictivas al comercio del oro que tiene como origen este tipo de minería. En esta zona no ha habido acciones de erradicación por lo que la ligera variación se da por el empleo de productos satelitales de mayor resolución espacial. Al respecto, es necesario recalcar que la detección de los cultivos de coca en esta zona es una tarea complicada, dado que parte importante de las parcelas implementadas se desarrollan asociados a otros cultivos de diferente estratos, como frutales, -en especial cítricos- y en algunos casos también crecen con otros cultivos de similares características, como la yuca. Sin embargo, los niveles de confusión han sido ajustados gracias a la adquisición de productos satelitales de mejor resolución espacial los cuales que ofrecen mayor detalle. Finalmente, en base a información recolectada en campo, la hoja de coca producida en este sector sería orientada al narcotráfico casi en su totalidad, siendo procesada mayormente a pasta básica de cocaína o también conocida como cocaína base, la cual sale del país rumbo al Estado Plurinacional de Bolivia y Brasil principalmente. La extensión total de las tres zonas de producción en el 2014, alcanzó las 4,741ha. 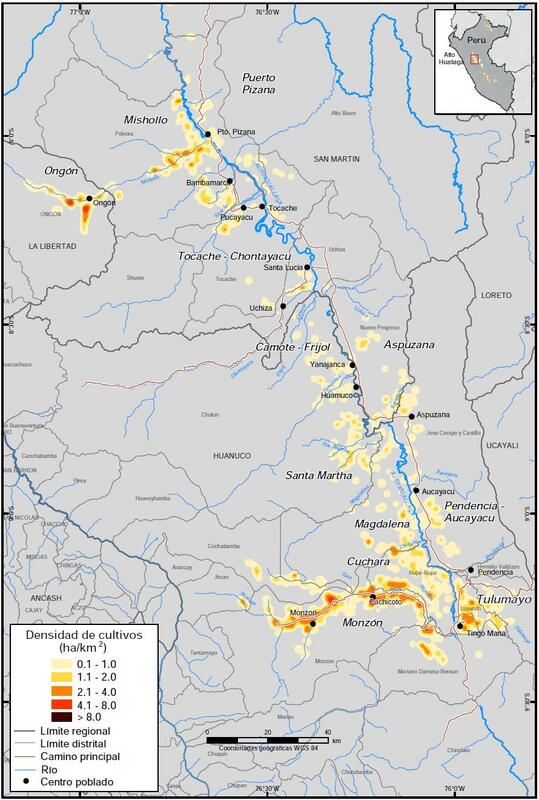 Esta extensión es 17.9% menor a la registrada en el año en el 2013 (5,774ha) y se da principalmente por las acciones de erradicación en la zona del Bajo Amazonas y en especial en el sector de Caballococha. 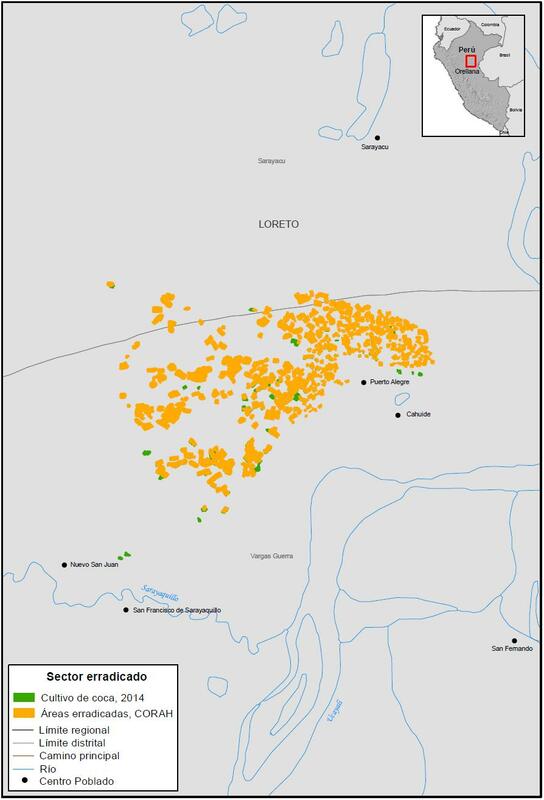 Esta zona incluye las localidades de Yubineto, Santa Clotilde (río Napo). El cuadro N�6 muestra una reducción de 11.1% que no corresponde a ninguna acción de erradicación o abandono, sino, como en otros casos se debe a la mejor calidad del registro de la imagen en comparación a la de otros años. En muy pocos casos los espacios ocupados por coca muestran secaderos, lo que indica que el procesamiento de la hoja se hace en base a hoja fresca al igual que en lado colombiano. Es necesario anotar que los cultivos de coca registran presencia incluso dentro de la zona de amortiguamiento del Parque Nacional Gueppi-Sekime y las reservas comunales Airo Pai y Huimeki. 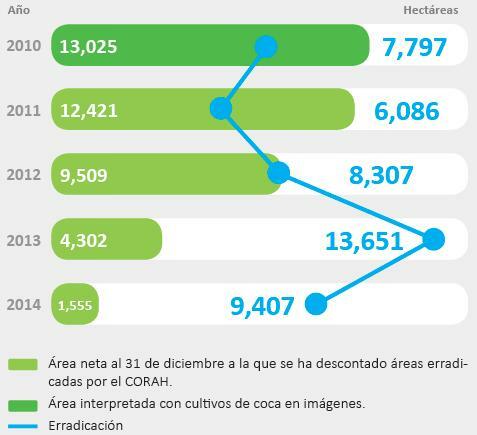 En el año 2014 la extensión ocupada por coca fue del orden de 2,137ha, cifra 30.4% menor a la registrada en el 2013 (3,070 ha). La reducción registrada en el presente año es el resultado de las primeras acciones de erradicación ejecutadas en esta zona, las que se centraron principalmente en la localidad de Caballococha. 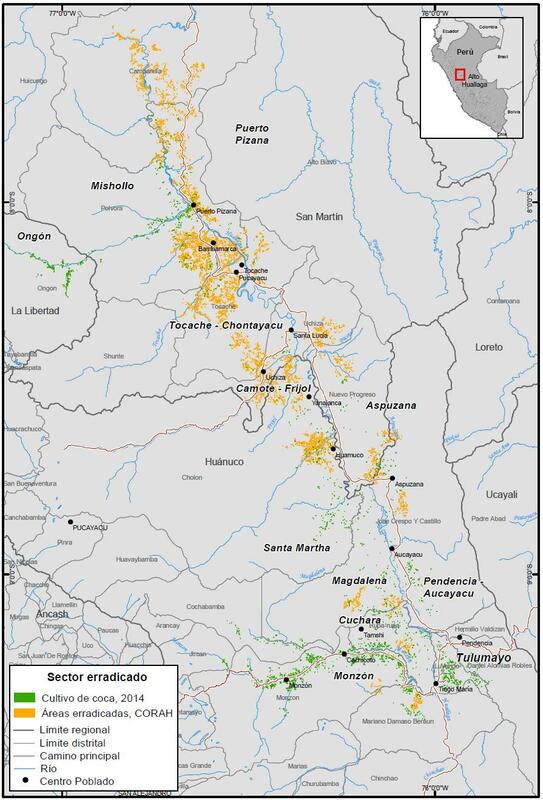 Esta singular zona de producción se ubica estratégicamente en un sector donde se unen las fronteras de Perú, Colombia y Brasil. Esto ha facilitado por un lado el abastecimiento de insumos químicos que requiere la transformación de hoja de coca en cocaína y por otro, una proximidad que facilita la salida externa de la producción local de derivados al creciente mercado brasilero. Caballococha, es el mayor foco del narcotráfico en esta zona y es el centro logístico de traficantes de Colombia y Brasil, como consecuencia de ello también es el centro donde cohabitan la violencia, el sicariato, la ilegalidad y la trata de personas con un arraigado tráfico de drogas que circula por el río Amazonas. La actividad cocalera se desarrolla bajo una marcada influencia "colombiana", es decir procesamiento de la hoja en fresco; el empleo de cilindros para la extracción del alcaloide de la hoja y la implementación de laboratorios bien montados para el refinamiento y obtención de cocaína. Después de la erradicación, los ámbitos de mayor concentración de cultivos de coca son Cushillococha, Bellavista, Erene, Yavari, San Pablo y otros de menor dimensión. Los espacios geográficos en el denominado Trapecio Amazónico, son propios de ambientes húmedos y mayormente planos a ligeramente inclinados que alternan con pequeñas elevaciones donde son ubicados los cultivos de coca en su gran extensión. Esto debido que la coca es poco tolerante a la humedad permanente y prefieren suelos de buen drenaje. La extensión para el 2014 ha sido calculada en 1,214ha es decir 6.5% mayor a la registrada en el año 2013 (1,140ha). Este ligero incremento es consecuencia de una mayor demanda de los traficantes que trasladan los derivados producidos hacia la costa para posteriormente ser enviados por vía marítima a mercados externos. El Alto Huallaga es la única zona de producción en el contexto nacional que por quinto año consecutivo registra una fuerte reducción del espacio dedicado al cultivo de coca como efecto directo de las intensas y continuas erradicaciones efectuadas por el CORAH. Al 31 de diciembre del 2014 la extensión ocupada se ha reducido a 1,555ha, es decir 63.9% menos en comparación al 2013 (4,302ha), representando la cifra más baja de su historia productiva. Es necesario recordar que esta zona hasta el año 2009 (17,497ha), fue la más importante en extensión y se constituyó en la más emblemática porque la producción de hoja y derivados se dio en un marco donde la presencia del narcotráfico y la subversión fue muy fuerte y dominante; así mismo, porque la población directa e indirectamente fue dependiente de los ingresos que generaba esta actividad. Es importante señalar que la imple-mentación de programas de desarrollo alternativo ha contribuido para que la reducción de cultivos sea sostenida. Se considera que lo que viene ocurriendo en esta zona donde se asocia la erradicación con el desarrollo alternativo representa un modelo replicable a otras zonas intervenidas por la erradicación; en principio como un medio para evitar la resiembra, segundo como una puerta de nuevas oportunidades a la población afectada y tercero legalizar la economía. En la actualidad los mayores niveles de concentración del cultivo ocurren precisamente donde no se ha erradicado, es decir Mishollo, Supte y algunos sectores del Monzón. El resto del área muestra que los espacios que fueron ocupados por coca, hoy han sido invadidos de malezas ("rabo de zorro", "shapumba") y los pocos cultivos de coca que subsisten se dan de manera dispersa. Definitivamente esta situación ha generado una fuerte reducción de la oferta de hoja y derivados y por lo tanto una menor presencia de traficantes. 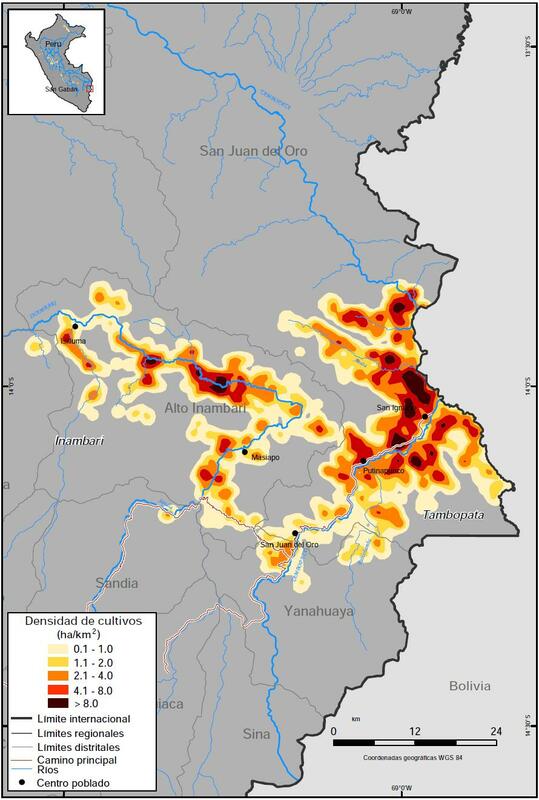 Como se muestra en la Figura 9, la erradicación en el Alto Huallaga, es un proceso que se da desde el año 2005, mediante la intervención de sectores estratégicos y puntuales. En el 2013, se llegó a erradicar 13,651ha y en el 2014 esta cifra ha alcanzado los 9,407ha. Las acciones de erradicación durante este año con excepción de Mishollo y Supte-Huayhuante, se han dado, con mayor o menor intensidad en todo el ámbito del Alto Huallaga. 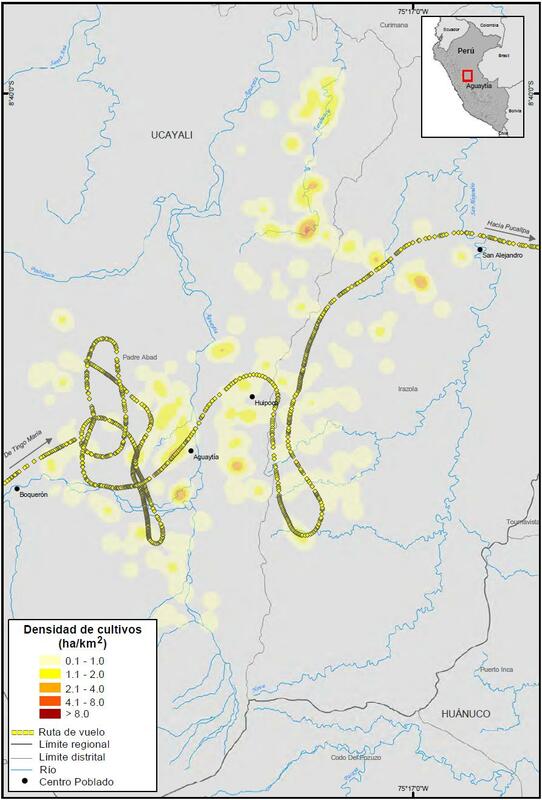 En el sector norte se ha intervenido las localidades de Sion, Pólvora, Puerto Pizana, Tocache, Uchiza, Nuevo Progreso; en el sector centro Yanajanca, Bolsón Cuchara, Aucayacu; y en el sector sur La Merced de Locro y parcialmente en las localidades de Cachicoto y Bella en el Monzón. Esta última localidad como se señaló en reportes anteriores constituía un escenario difícil no solo para las acciones de erradicación sino incluso para la implementación de programas de post-erradicación; no obstante, la estrategia del Estado (DEVIDA) en este caso particular ha derivado efectos positivos que pueden ser corroborados el día de hoy. Erradicación en el Alto Huallaga. Fuente: CORAH. 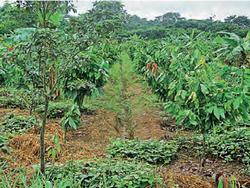 Plantaciones de cacao en el Huallaga. Fuente: DEVIDA. El Monzón, conjuntamente con Tocache y Uchiza por muchos años constituyeron los sectores más importantes de producción cocalera del Alto Huallaga. En la actualidad los espacios ocupados por coca se han reducido al mínimo. En el caso específico del Monzón considerada la más difícil y hostil, en los tres últimos años (2012-2014) se logró erradicar 10,534ha, dejando un remanente de cultivos menores al 10%. A pesar de ello en el último año se ha detectado que algunos sectores como Cuyacu, Manchuria, Cashapampa, Sachabaca y La Granja han iniciado resiembras; sin embargo, parecería que de momento esto no se da en forma masiva. Si bien la oferta de hoja en el Monzón ha disminuido considerablemente y los niveles de producción son muy inferiores a los conocidos antes del 2005, consideramos que los indicios de resiembra de coca post-erradicación en el Monzón es una llamada de atención al Gobierno para acelerar y generar estrategias sólida de desarrollo que atenúen esta tendencia. Al respecto, hay que considerar que este valle tiene características edáficas y fisiográficas particulares, sus suelos son muy superficiales y de gran pendiente, condiciones que favorecen la erosión. Por ello, el desarrollo planteado deben ir más allá de los productos ofrecidos también debe centrarse en programas de reforestación; teniendo en cuenta que según el Inventario de suelos del Perú elaborado en 1969 por ONERN, no contempla actividades agropecuarias nuevas y/o tradicionales, restringiendo su uso a la protección de suelos (reforestación con fines de protección). Fuente: Sistema nacional de monitoreo apoyado por UNODC - Gobierno de Perú. Los límites y los nombres utilizados en este mapa no implican la aceptación oficial por parte de las Naciones Unidas. La extensión calculada para el 2014 es de 1,322ha que representa el 3.1% del total existente a nivel nacional. 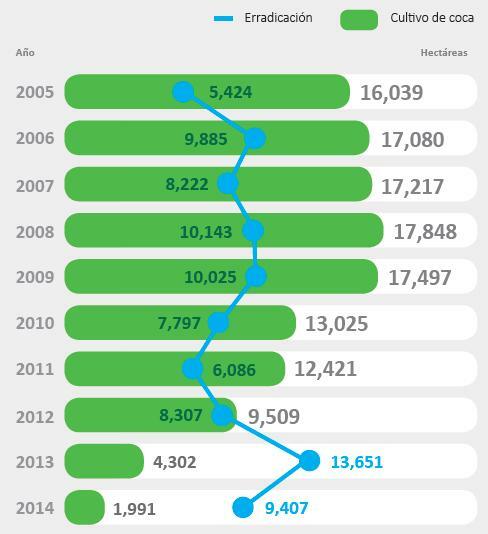 En comparación al año anterior de 1,110ha, registra un incremento de 19.1%, esto graficaría que entre los años 2010 al 2014 el cultivos de coca ha aumentado en su extensión. Este periódico incremento seria en primer lugar por la demanda de pasta básica, que estaría siendo traslada hacia las regiones de Madre de Dios y Puno, para luego acceder al Estado Plurinacional de Bolivia y posteriormente a Brasil. Hay hechos que confirman lo mencionado con la destrucción de laboratorios de procesamiento de hoja de coca por parte de la policía, que evidencia la presencia del narcotráfico en esta zona. 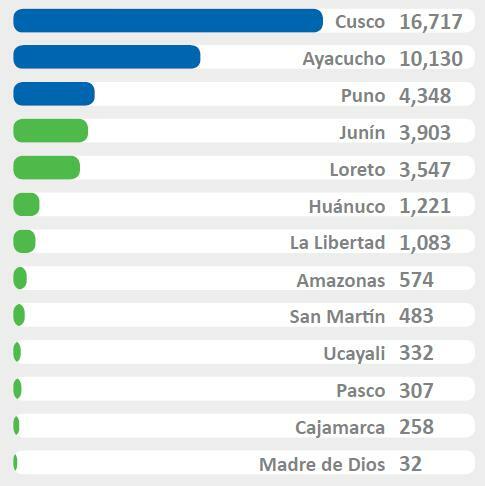 En segundo lugar hay una demanda creciente en la ciudad de Cusco; zona turística por el cual el incremento del turismo también estaría demandando el flujo de derivados cocaínicos desde Kcosñipata. Es importante mencionar que los cultivos de coca siguen teniendo presencia en las zonas de amortiguamiento desde hace unos años en el Parque Nacional Manu y en la Reserva Comunal Amarakaeri. Los niveles de concentración del cultivo de coca se dan en las localidades de Patria y Pilcopata, cuyo manejo incluye un uso semi-intensivo de agroquímicos con promedios de producción de hoja que bordean las 1.5TM. La extensión ocupada por cultivos de coca para el año 2014 ha sido calculada en 964ha, es decir 5.9% mayor que el año 2013 (910ha). Representa el 2.2% del total existente en el contexto nacional. Lo registrado en el presente año, a pesar de la pequeña diferencia indica que el área ocupada por coca en los tres últimos años se ha mantenido estable. Como se señaló en el reporte de monitoreo del 2013, la estabilidad mencionada está vinculada a la mayor demanda y cotización de la mano de obra que requiere la minería extractiva de oro que ilegalmente se ha establecido hace varios años en ambas márgenes del río Inambari. La propuesta supera ampliamente lo pagado por la actividad legal incluso la cocalera que por muchos años predominó en la economía local. Esta situación ha incentivado a que muchos agricultores dedicados al cultivo de coca se incorporen en esta actividad, lo que de alguna manera ha evitado de momento la ampliación de los cultivos o la implementación de nuevas áreas. Los registros satelitales empleados en la detección y medición de cultivos de coca también han permitido percibir para este año una intensa apertura de chacras nuevas en espacios aparentes para el cultivo. Esto se viene dando en sectores altos de las quebradas que fluyen al río Inambari, incluso dentro de la zona de amortiguamiento del Parque Nacional Bahuaja Sonene. Se presume que esto se estaría dando por el hecho que el Estado Peruano ha dictado medidas restrictivas al comercio del oro que tiene como origen este tipo de minería. El Alto Chicama, se ubica en la región de La Libertad y abarca parte de las provincias de Otuzco y Gran Chimú. El área ocupada por cultivos de coca para el año 2014, es de 587ha, representa el 1.4% de lo existente a nivel nacional. La variación de esta cifra en comparación a la del año anterior (585ha), es de 0.3%. Cabe señalar que en el 2014, se han empleado imágenes SOPT 6/7 de mayor resolución 1.5m, a diferencia del 2013, en que se utilizó RapidEye de 5m de resolución espacial, la que ha permitido discriminar mucho mejor el cultivo. La mayor concentración de los cultivos de coca, se ubican en los distritos de Compín, Otuzco, Huaranchal, Sayapullo, y en menor cantidad en Charat y Usquil. Parte de la producción de hoja de coca cosechada entre El Milagro y Rancho Grande, es comercializada a través de ENACO y algunos centros mineros; en cambio, la zona ubicada entre El Zapotal, Cerro Blanco y Huayobamba, en donde existe un mejor manejo del cultivo y mayor producción, al parecer es comercializada de manera ilegal. El régimen pluvial en esta zona es bastante bajo (150mm de precipitación anual), es por ello que los cultivos se manejan con riegos tecnificados. La especie cultivada en esta zona es la Erythroxylon truxillense, ecotipo de la zona, la cual crece en suelos de pendiente moderadas y ligeramente onduladas. 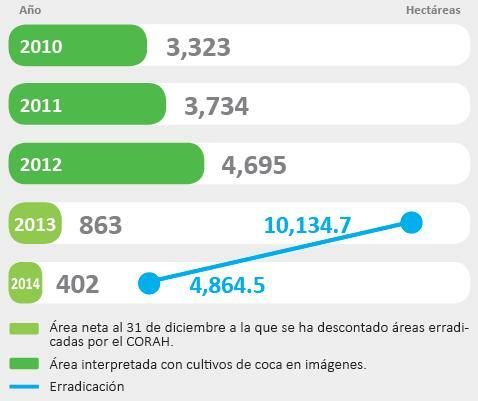 Para esta zona cocalera se reporta 402ha cultivadas con coca al 31 de diciembre del 2014. Este valor significa el 0.9% del total cultivado a nivel nacional. La diferencia porcentual respecto al año pasado (863ha) es de 53.4% menos. Esta reducción se sustenta básicamente por las actividades de erradicación efectuadas. 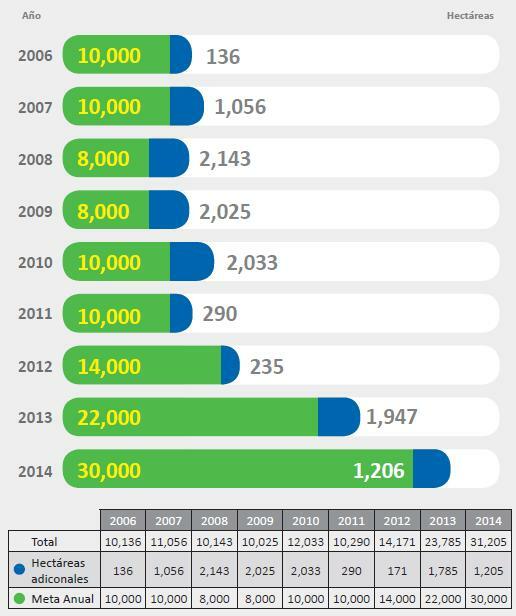 Desde el año 2007 hasta el año 2012 esta zona registró altos índices de crecimiento anual. La situación actual muestra un panorama donde el remanente de cultivos de coca se da de manera dispersa en unidades inferiores a una (1) hectárea, predominando suelos desnudos y/o cubiertos de malezas. En sobrevuelos efectuados después de la erradicación se pudo observar que los índices de resiembra fueron mínimos. Se considera que esto ocurre debido a que la población que se dedicó al cultivo de coca y la producción de derivados fue mayormente "golondrino", es decir migrantes procedente del Alto Huallaga y Aguaytía que ingresaron a esta zona con el único objetivo de dedicarse al cultivo. Esto se evidencia por la ausencia de organizaciones campesinas es así que ocurrida la erradicación, retornaron a su centro de origen. En el Pichis-Palcazú predominan amplias áreas planas dedicadas a la ganadería. Entre los años 2011 y 2012 esta característica fisiografía fue aprovechada por el narcotráfico para implementar, una amplia red de pistas clandestinas. En estas circunstancias se convirtió en el principal centro de acopio de derivados de coca y de salida aérea, teniendo como punto intermedio Estado Plurinacional de Bolivia y destino final el creciente mercado brasilero. En el año 2013 el Gobierno Peruano desactivo el 80% de ellas |23| lo que motivó que este tipo de salida se traslade al VRAEM. El área ocupada por coca en el Aguaytía a diciembre del 2014 fue de 332ha, valor que representa el 0.8% del total nacional. Como se puede apreciar en la Figura 13, el área en producción se ha reducido en un 81.5% en comparación a los resultados obtenidos para esta zona en el 2013 (1,796ha). Esto es consecuencia de las acciones de erradicación llevadas a cabo por el Estado a través del CORAH en el 2014. Esta zona igualmente fue sometida a la erradicación en los años 2011, 2012 y 2014. Al igual que el Pichis-Palcazú-Pachitea la situación actual es de escasa presencia de cultivos, incluso en sectores como Huipoca que antes del 2011 concentró la mayor extensión de cultivos. En los sobrevuelos efectuados a fines del año 2014 se ha podido observar una intensa apertura de nuevas chacras en ambientes de pendiente moderada aparentes para la instalación de nuevos cultivos de coca. En tal sentido de no tomarse las medidas correctivas y de desarrollo a corto plazo se corre el riesgo que la resiembra se de en niveles importantes. Incluye los sectores de Mazamari (región Junín), Contamana (región Loreto), Ca-llería, Masisea (región Ucayali), Huallaga Central (región San Martín). La extensión conjunta para el año 2014 ha sido calculada en 390ha, que representa el 0.9% del total existente a nivel nacional. Comparado con lo registrado en el 2013 (950ha), se ha determinado una reducción de la extensión equivalente a 58.9%; debido a las acciones de erradicación efectuadas por el CORAH en la zona de Orellana (Contamana), en donde se ha logrado una reducción de 94.7% en relación al año anterior. La producción potencial de hoja de coca para el año 2014, ha sido calculada en 100,840TM de este total según INEI 9,000TM son destinadas al consumo y uso tradicional, por lo tanto 91,840TM estarían articuladas al narcotráfico. Si comparamos esta cifra con la producción del año 2012 (comparable), esta fue del orden de las 128,739TM, mientras que la variación en la extensión acumulada para los mismos años ha sido del orden de-30%, esto se debe principalmente a que el VRAEM, que es la zona con mayor extensión a nivel nacional es a su vez el sector con mayores índices de rendimiento cuyo promedio es de 3.6TM/ ha/año, dada la alta densidad de los cultivos (densidades superiores a 200,000 plantas/hectárea) |24| y además no ha sido sometida a acciones de erradicación a la fecha, es así que para el año 2014 este sector ha producido un volumen potencial de hoja de coca que representa el 67.8% de la producción nacional. La segunda zona con mayor producción de hoja de coca en el 2014, es La Convención y Lares que contribuye con el 14.9% a la producción nacional. En esta zona el cultivo se maneja con densidades entre 20,000 y 30,000 plantas/hectáreas, con rendimientos promedios del orden de 1.457TM/ha/año. 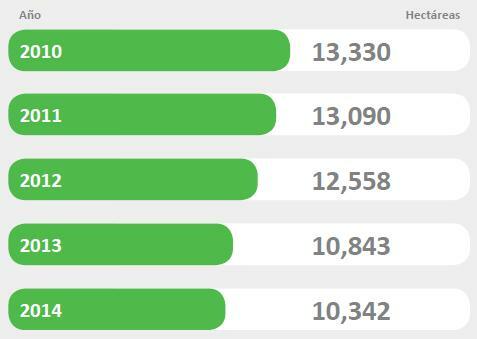 El sector de Inambari - Tambopata es la tercera en orden de importancia en lo referente a la producción de hoja de coca en el año 2014, contribuyendo con 4.4% de la producción nacional. La densidad de plantas en este sector varía entre 20,000 a 25,000 plantas/hectáreas con índices de rendimiento anual de 1.29TM/ha/año, adicionalmente es importante resaltar que este sector gran parte de los cultivos se encuentran bajo sombra. Con referencia al Alto Huallaga, es importante resaltar que la oferta de hoja de coca se ha reducido significativamente en el 2014, pasando de 12% de representatividad a nivel nacional a 3.5% (incluido Monzón), dada las permanentes acciones de erradicación realizadas en este sector. Es importante resaltar que para la determinación de la producción potencial de hoja, UNODC ha empleado datos de rendimiento promedio de hoja por hectárea que datan del año 2003 -2004 y para las zonas de VRAEM, Alto Huallaga y La Convención y Lares datos del 20052006. En el entendido que la tecnología de manejo del cultivo en las diferentes zonas de producción ha mejorado en los últimos años, DEVIDA en el año 2014, ha encargado la ejecución de un trabajo que permitirá la actualización de los rendimientos en las principales zonas. A la fecha se tienen resultados preliminares para algunas de las zonas y para fines del 2015 se espera contar con información de otros sectores y así tener un cálculo de mayor aproximación referente a la producción potencial de hoja de coca. Respecto a la producción potencial de clorhidrato de cocaína, UNODC a partir del año 2009 no se ha reportado este dato ya que los requerimientos de hoja de coca para la producción de un kilogramo de clorhidrato de cocaína son actualmente inferiores a los que se emplearon hasta el año 2008 (375 Kg de hoja x 1 kg de cocaína). A la fecha UNODC ha efectuado tres trabajos especializados, con el fin de actualizar dichos requerimientos, dos de ellos a través del proyecto PRELAC basado en entrevistas a "químicos o cocineros" y uno bajo un convenio con DEVIDA (financiado por el gobierno francés), este último incluye tres temas; el primer tema referente a la recolección de información a través de entrevistas (similar a los estudios de PRELAC), el segundo consiste en la validación de los datos recolectados a través de simulaciones de los procesos de transformación en campo y el tercer tema, a la determinación de análisis de pureza en laboratorio. Los resultados preliminares obtenidos mediante las entrevistas para los tres estudios (130 entrevistas) confirmarían menores requerimientos de volúmenes de hoja; sin embargo, a la fecha no se han podido ejecutar el segundo y tercer tema debido a restricciones legales que autoricen su ejecución. UNODC registra las variaciones de precios de la hoja de coca y sus derivados incluyendo los precios de los insumos químicos utilizados por el narcotráfico en las distintas zonas cocaleras del país. Desde hace varios años se viene acopiando información en zonas cocaleras de importancia que determinan los precios a nivel nacional. En el presente año y conjuntamente con el Gobierno Peruano; UNODC, ha realizado el análisis de precios en zonas de importancia como son Aguaytía, Pichis - Palcazú, Pachitea, Alto Huallaga (Monzón) y VRAEM. Actualmente se viene gestionando ampliar la cobertura de registro de precios a otras zonas cocaleras del país, como La Convención y Lares, Kcosñipata; entre otros. Para el año 2014, el precio promedio registrado de la hoja seca en base a los cuatro sectores señalados, es de US$ 4.3/Kg. Este dato se mantiene constante desde el 2013; sin embargo, estos precios siguen siendo mayores a lo que oferta ENACO, cuyo nivel de compra es aproximadamente US$ 2.6/Kg. ENACO; es la empresa del estado, que compra la hoja de coca seca de acuerdo a su calidad; primera, segunda o tercera; en cambio el narcotráfico en los últimos años está siendo más exigente comprando solo hoja de coca de primera y de segunda calidad y del tiempo de cosecha; porque no les es rentable comprar hoja de menor calidad ya que no garantiza la cantidad y calidad de los derivados cocaínicos producidos. Los mayores precios mensuales se registraron en el Monzón con US$ 8.2/kg en los meses de febrero y abril y el menor precio se registró en Aguaytía con US$ 2.1/Kg en el mes de octubre; estos valores obedecen al precio promedio de hoja; sin embargo, se observa en el cuadro N� 15 que en el promedio aritmético anual por sectores el VRAEM sigue siendo el sector que concentra el menor precio de hoja de coca articulada al narcotráfico con US$ 3.7/Kg. Esto es sustentado por la mayor oferta estacional de hoja que es impulsada por la elevada productividad de los cultivos en esta zona. El Monzón continúa siendo la zona que presenta el registro de precios más elevados, esto se basa en el supuesto que el contenido de alcaloide de la hoja de coca, es mucho mayor que de otras zonas cocaleras del país. En el 2013 por efecto de la erradicación, en Monzón el precio de la hoja subió significativamente. Para el 2014 estos niveles se siguen manteniendo con 5.2 U$/kg (ligeramente más bajo que en 2013). Cuadro 15. Precio mensual de hoja de coca por zonas en Perú, 2014 (US$/kg). Respecto a los precios de pasta básica, hubo una variación de -2.3%; esta disminución se da calculando el precio promedio aritmético registrado en el 2013, de US$ 863/Kg, con el presente año 2014 cuyo precio promedio es de US$ 843/ Kg, esta relativa disminución tiene mayor impacto en el Aguaytía, registrando US$ 770/Kg en el 2014 con una variación de -24.9% en comparación al año anterior que registró US$ 1 026/Kg. Una posible explicación para la disminución de los precios es el aumento de los esfuerzos en la erradicación con un mayor control policial, lo que podría disuadir a los compradores el acceso a estas zonas. Esto podría obligar a los agricultores a vender hoja a precios más bajos; sin embargo, Monzón sigue siendo la zona que ofrece el mayor precio de pasta básica con US$ 945/Kg en el presente año 2014; el precio es mayor comparado con el 2013 que fue de US$ 917/Kg. Cuadro 16. Precios de pasta básica de cocaína en Perú por zonas, 2010 - 2014 (US$/kg). Por lo apreciado en el cuadro anterior la disminución de pasta básica, también será reflejado en el precio de clorhidrato de cocaína que va a tener una disminución del precio en US$ 1,178/Kg, con una variación de -10.1%, en comparación con el año anterior 2013, que registro US$ 1,310/Kg. Este menor registro en pasta básica y clorhidrato de cocaína podría estar asociado a los niveles de pureza y al stock que existe; en lo primero el precio de compra estaría condicionado a la calidad, que por factores de hoja, insumos, entre otros; podría disminuir el precio de compra; el segundo factor sería importante porque al haber mayor control de interdicción, alejan a los potenciales compradores ocasionando que el acopio de droga se incremente y el precio de venta disminuya. La presencia del Estado Peruano en zonas donde ha habido erradicación es muy importante; con el aporte técnico, asistencia social, capacitación al agricultor, etc; estaría propiciando en cierta manera que el agricultor cocalero que siempre se dedicó a la siembra de coca, no vuelva a sembrar o por lo menos la siembra de coca disminuya significativamente propiciando periódicamente al cambio por cultivos alternativos productivos y de mejor precio de compra que puedan competir con el precio de la hoja de coca. Esto se refleja en las zona de Alto Huallaga y Aguaytía. Sin embargo, la presencia del Estado en el VRAEM, no estaría ocasionando a corto plazo el cambio necesario por otros tipos de cultivos; a pesar de que hay un mayor control por parte de la policía y las fuerzas armadas sigue siendo el VRAEM, la zona que presenta mayor dinámica en siembra de cultivos de coca y de venta de derivado cocaínicos a nivel nacional. La reducción del espacio cocalero ilegal es una Política de Estado que se ejecuta a través de un Plan Anual que responde a la Estrategia Nacional de Lucha contra las Drogas 2012-2016, establecido por el Gobierno Peruano. El Plan Anual de Reducción del Espacio Cocalero Ilegal en el Perú para el año 2014 (aprobado mediante Resolución Ministerial N� 065-2014-IN/DGCO), es ejecutado por el Proyecto Especial CORAH, de acuerdo a información proporcionada por esta entidad, en el año 2014, se erradicaron 31,205.64ha de cultivos de coca, sobrepasando la meta programada por el Gobierno (30,000ha) y superando así el record histórico. El CORAH, con el apoyo de la Dirección Antidrogas PNP (DIVOEAD) y la Dirección de Aviación Policial, priorizó sus acciones durante el año 2014 en el sector de Aguaytía, reportando un total erradicado de 14,161.4ha (46.9% del total erradicado durante el año), que incluye las localidades de Aguaytía, Campo Verde, Irazola, Padre Abad, Curimana y Tornavista - Von Humboldt. Es importante resaltar que del total reportado como erradicado 3,005.6ha corresponden a cultivos resembrados. El segundo sector con mayor área erradicada en base al reporte de CORAH, corresponde al Alto Huallaga, en donde se registra un total de 9,407.1ha erradicadas, correspondiendo 186ha al sector de Monzón, en las localidades de Bella y Cachicoto, de las cuales 70.4ha corresponden a áreas resembradas y 9,221.1ha corresponden a ambas márgenes del río Huallaga, habiéndose concentrado los trabajos en el sector norte en las localidades de Pizana, Polvora, Tocache y Uchiza, del total erradicado en el Alto Huallaga el 43.6% corresponde a áreas resembradas, es decir 4104.9ha. 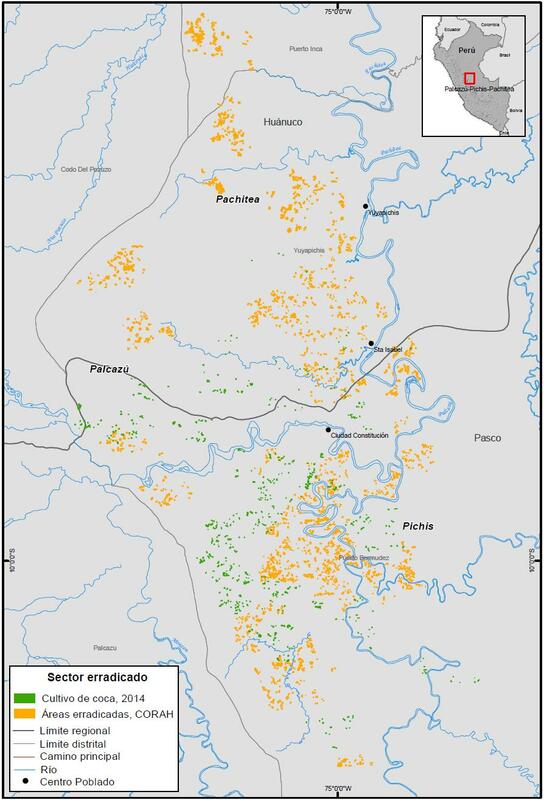 Palcazu-Pichis-Pachitea es el tercer sector intervenido en orden de extensión, es este sector se reporta un total de 4,864.5ha, de las cuales son consideradas como resiembra únicamente 260.4ha. Es importante resaltar que estos tres grandes sectores ya habían sido intervenidos por el CORAH en años anteriores, si consideramos la información reportada entre los años 2011 y 2014 se han erradicado en el Alto Huallaga un total de 37,450.7ha (de las cuales 10,534.7ha corresponden a Monzón), Aguaytía 24,378.3ha y Pichis-Palcazú-Pachitea 14,999.2ha. 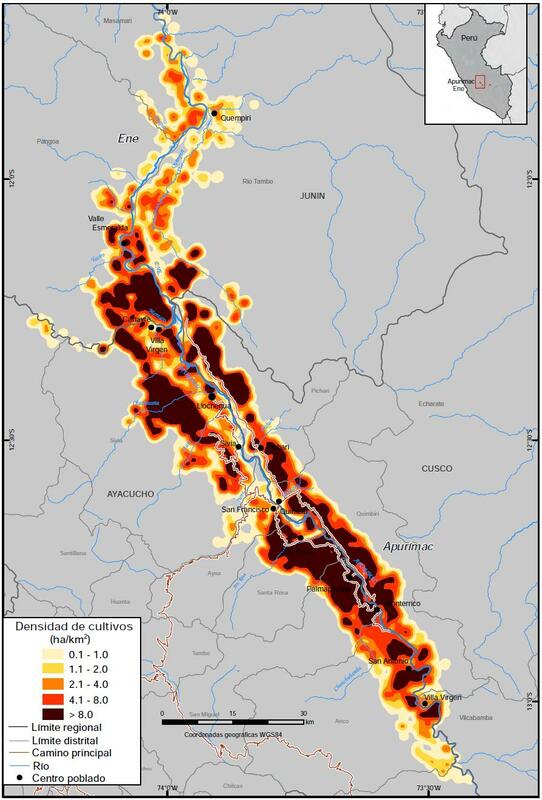 En el año 2014, el CORAH efectuó acciones de erradicación por primera vez en los sectores de Caballococha (Bajo Amazonas) y Orellana (Contamana). En lo referente a Caballococha se reporta un total de 1,816.5ha erradicadas de las cuales 138.1ha corresponden a cultivos menores a un año de edad y 50.7ha son consideradas como áreas resembradas. En el sector de Orellana las acciones dan como resultado un total de 956.1ha erradicadas, sin registrarse resiembras. Asimismo, durante las acciones de erradicación efectuadas en el 2014, se han destruido un total de 19,917m2 de al-mácigos evitándose así la instalación de 1327.8ha de nuevos cultivos, en base a los cálculos efectuados por CORAH. Es importante resaltar que la mayor concentración de almácigos se dio en el sector de Aguaytía (62.4%), seguido del Alto Huallaga (15.3%) y Pichis-Palcazú-Pachitea (13.9%), así mismo se reportó un total de 103 laboratorios destruidos. 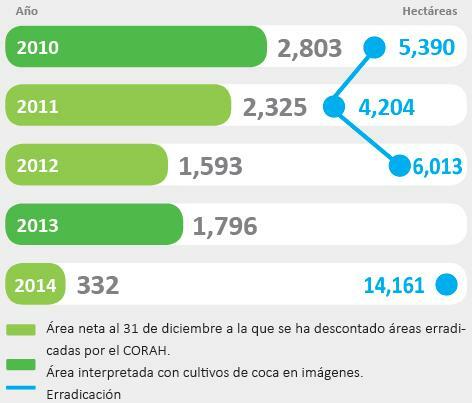 Como resultados de las acciones sostenidas de erradicación, el CORAH en el 2014 concretó sus acciones con resultados positivos, registrándose reducciones de los espacios cocaleros en los diferentes sectores intervenidos. En este sentido también juega un papel importante las acciones post erradicación y el Programa de Responsabilidad Social Comunitaria -PRSC que trabaja en apoyo a las comunidades cercanas a las operaciones de erradicación, afectadas por la producción y tráfico ilícito de drogas. Este Programa es ejecutado por personal especializado del Cuerpo de Asistencia para el Desarrollo Alternativo -CADA, quienes desarrollan un conjunto de actividades destinadas a mejorar su economía familiar, promover una estructura legal que propenda a su formalización, a través de la elaboración de Expedientes Técnicos para su registro; e igualmente, propicia un cambio de actitud en las personas para que tomen conciencia de su situación legal y de las consecuencias que origina la producción excedente de hojas de coca, a fin que opten por otras alternativas económicas aprovechando el potencial que les ofrece el medio; en ambos casos, los pobladores de estas comunidades puedan emprender su desarrollo personal, familiar, económico y social, logrando su inclusión social y articulación al proceso de desarrollo de la Región. Durante el año 2014 este Programa ejecutó 6,458 actividades en 113 comunidades, beneficiando a 37,124 personas. La determinación de la extensión del cultivo de coca en el Perú se sustenta en la interpretación y análisis de imágenes satelitales. Para el monitoreo del 2014, se utilizaron treinta y siete (37) escenas SPOT 6/7, de 1.5 m de resolución. Estas escenas mayormente han sido registradas entre los meses de julio y noviembre del 2014. Desde el año 2000, el proyecto de monitoreo de cultivos de coca se ha sustentado en base al análisis y procesamiento de imágenes satelitales de mediana y alta resolución. Para el monitoreo correspondiente al año 2014, se contó con imágenes SPOT 6/7 de 1.5m de resolución, para el recubrimiento de las zonas con cultivos de coca. Las imágenes SPOT 6/7 son adquiridas con un nivel de procesamiento básico, que permite obtener los parámetros de toma del sensor (metadata), el cual permite realizar la ortocorrección, con modelos de elevación y puntos de control tomados en campo. Dependiendo de la cobertura de nubes y neblina presentes en la imagen, éstas son filtradas mediante un modelo algorítmico. Si el área estudiada requiere de varias imágenes, los niveles de detalle y contraste son compatibilizados en base a la comparación de histogramas. La apariencia de los cultivos de coca en las imágenes satelitales, depende de la pendiente del terreno, la exposición al sol (áreas soleadas o con sombra de las imágenes satelitales), y la etapa de desarrollo foliar del cultivo. Esta categoría corresponde a los cultivos de aproximadamente 12 meses. La cobertura foliar en esta etapa varía de 20% a 40%. Los rasgos espectrales de estas áreas están dados mayormente, por las características del suelo y el color de la escasa cobertura foliar de la coca. La identificación visual y espectral requiere de verificaciones de campo e información de años anteriores. Esta categoría corresponde a los cultivos de coca entre 12 y 24 meses de edad, en cultivos nuevos, y de 3 a 4meses, después de cada cosecha, para los cultivos antiguos. En esta etapa los cultivos de coca tienen una alta densidad foliar y muestran, en las imágenes satelitales, un alto nivel de contraste. Esta categoría corresponde a campos de coca en los cuales las hojas ya han sido recolectadas en su totalidad y solamente quedan plantas y tallos desnudos. Las características espectrales de estas áreas corresponden básicamente al color del suelo. La identificación y mapeo de estos campos, requieren del uso de información adicional, tales como el censo del año anterior, al igual que la información de campo. Esta categoría corresponde a campos en abandono que fueron rehabilitados productivamente. Este proceso incluye el deshierbo y el enriquecimiento de plantas nuevas en plantaciones antiguas, entrando en producción en un período muy corto. La primera cosecha puede llevarse a cabo de 3 a 4 meses después de la rehabilitación. Las características espectrales son similares a los cultivos en estado de madurez. El uso del mapeo de coca del año anterior facilita la identificación de campos de coca rehabilitados. Esta categoría incluye parcelas en la cuales el cultivo de coca, mantiene su estructura de campo, pero comparte el espacio ocupado con cultivos lícitos. Los cultivos asociados son generalmente productos agrícolas anuales, tales como la yuca y el maíz. Los rasgos espectrales de estos campos son la combinación de las características espectrales del follaje de la coca, del cultivo asociado y del color del suelo. 3.1.4 Verificación de campo y corrección de los patrones de identificación. La verificación de campo permite perfeccionar los patrones de identificación y reducir los niveles de confusión que se dan mayormente, con áreas de purma (matorrales), cultivos anuales de corto período vegetativo, pequeños pastizales y pequeñas áreas abiertas. Corregidos y ajustados los patrones de identificación, se procede a la clasificación visual de toda el área de interés del proyecto. Los expertos han adquirido una elevada experiencia en el proceso de verificación terrestre y aérea. Para facilitar la verificación fue muy importante contar con imágenes satelitales y bases de datos empleadas en años anteriores. Comparación con la clasificación de cultivos de coca del año anterior: Entre otros permite determinar las unidades de coca que en la fecha de toma de la imagen satelital se encuentran cosechadas o en sus primeros estadios de rebrote. Es necesario señalar que las unidades de coca en estas etapas de desarrollo muestran características espectrales de están dadas por la coloración del suelo, al no contar con una cobertura foliar suficiente para ser consideradas como coca. Control terrestre: A través de transectos georeferenciados (GPS) en campo, un determinado número de parcelas de coca en cosecha, en rebrote, en desarrollo foliar intermedio y en estado de máxima expresión foliar (estado maduro). Complementariamente, se registran datos de distancia entre líneas y entre plantas. Esta información es procesada y comparada con la clasificación satelital efectuada en gabinete y permite corregir errores de clasificación (confusión con otros cultivos) y determinar los niveles de aproximación de la clasificación efectuada. Este tipo de control es cada vez más difícil por el riesgo que implica de acceder a los campos de coca para la toma de datos, por el hecho de ser un cultivo ilícito muy ligado al narcotráfico. Sobrevuelos de verificación: Para el presente informe hemos recibido el apoyo de la Fuerza Aérea del Perú con vuelos de verificación, efectuados con una altura promedio de 6,000 pies; con un equipo de video de alta definición digital que es un SENSOR EO STAR SAFIRE FLIR HD; este sensor ofrece un producto de alta definición digital el cual nos ofrece un zoom de 120x, las líneas de vuelo se muestra en coordenadas geográfica; y tiene como característica importante que el sensor FLIR, ayuda a superar la neblina atmosférica; así mismo UNODC realizó sobrevuelos de verificación con GeoVi-deo en zonas complementarias. Bajo esta condición se descuenta físicamente la extensión erradicada. Para este fin, lo primero que se hace es corregir las distorsiones de la información poligonal reportadas por el CORAH (entidad del Estado encargada de la erradicación). Después de este proceso, se filtra la información brindada por CORAH para determinar los polígonos erradicados después de la fecha de toma de la imagen, dicha información es superpuesta digitalmente sobre la clasificación poligonal de coca detectada en las imágenes correspondientes. Cuando existe coincidencia - completa o parcial (mayor al 50%)- de un polígono de coca detectada con un polígono de coca erradicada, éste polígono es eliminado. Este proceso de eliminación no difiere entre coincidencia parcial y completa. Las diferencias en extensión, localidad y forma, observada a menudo, entre coca detectado y erradicación registrada por CORAH probablemente (entre otros), tiene su origen en ciertas distorsiones no-corregibles (no todos son corregibles), diferencias en fecha, diferencias en fuente de información (imagen satelital con pixeles interpretada en gabinete vs GPS registrados en el campo). En este caso la información poligonal de erradicación tiene un carácter referencial o de comparación. Cuando el intérprete detecta y delimita un polígono como coca en producción, éste es contrastado con la base poligonal de erradicación; si el polígono es registrado como erradicado, pero mantiene rasgos espectrales como coca en producción, dicho polígono no es eliminado y es contabilizado como cultivo de coca. Por el contrario, si tiene rasgos de suelo desnudo o sin cobertura vegetal éste es eliminado. 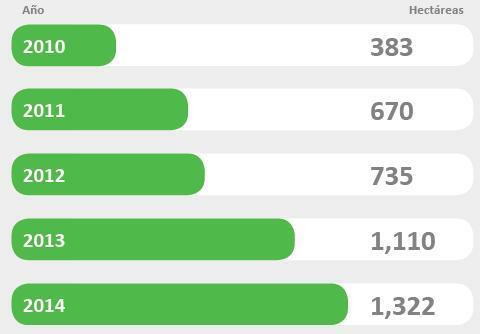 Los datos de producción potencial de hoja de coca calculados para el año 2014, no son comparables al año anterior, debido a que se ha empleado una metodología de cálculo diferente. El cálculo se ha efectuado en base a la extensión determinada al 31 de diciembre del 2014. Calculo de Producción (zona) = Área neta (zona) x rendimiento (zona). Es importante resaltar que para este cálculo, UNODC ha empleado datos de rendimiento promedio de hoja por hectárea que datan del año 2003 -2004 y para las zonas de VRAEM, Alto Huallaga y La Convención y Lares datos del 2005-2006. CADA: Cuerpo de Asistencia para el Desarrollo Alternativo. CECOVASA: Central de Cooperativas del Valle Sandia. CORAH: Control y Reducción de la Hoja de Coca en el Alto Huallaga. DEVIDA: Comisión Nacional para el Desarrollo y Vida sin Drogas. DIRANDRO: Dirección Antidrogas, Policía Nacional del Perú. DIVOEAD: División de Operaciones Especiales Antidrogas. ENACO: Empresa Nacional de la Coca. FAP: Fuerza Aérea del Perú. ICMP: Programa de Monitoreo de Cultivos Ilícitos de UNODC. ONERN: Oficina Nacional de Evaluación de Recursos Naturales. PNP: Policía Nacional del Perú. PRELAC: Prevención del Desvió de Sustancias Precursoras de Drogas en los Países de América Latina y el Caribe. PROVRAEM: Proyecto Especial de Desarrollo del Valle de los Ríos Apurímac, Ene y Mantaro. SIMCI: Sistema Integral de Monitoreo de Cultivos Ilícitos. TID: Tráfico Ilícito de Drogas. UNODC: Oficina de las Naciones Unidas contra la Droga y el Delito. VRAEM: Valles de los ríos Apurímac, Ene y Mantaro. 4. No determinado, debido a que aún no se ha concluido el estudio para la determinación de los "factores de conversión hoja de coca-cocaína.